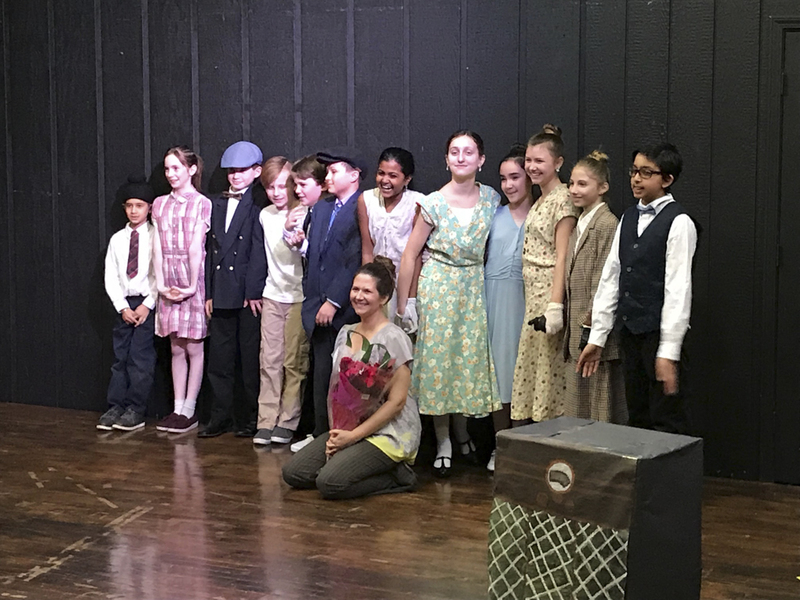 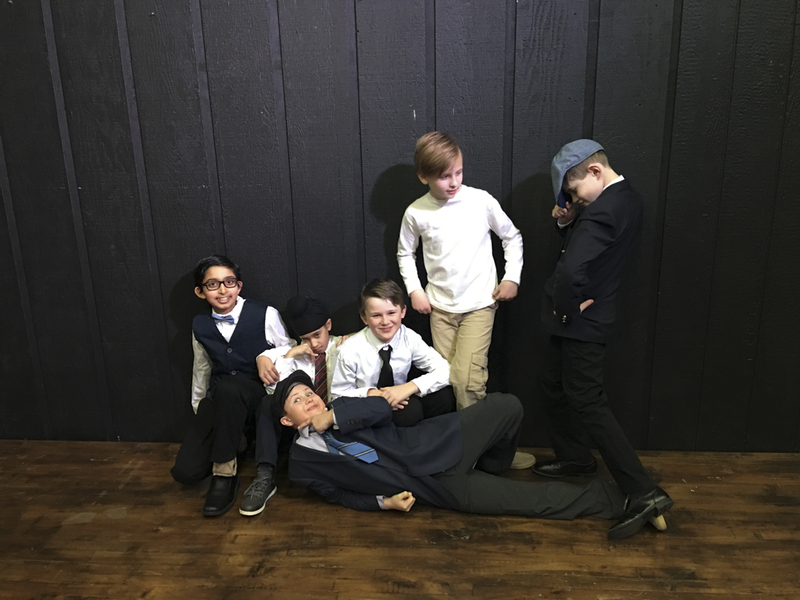 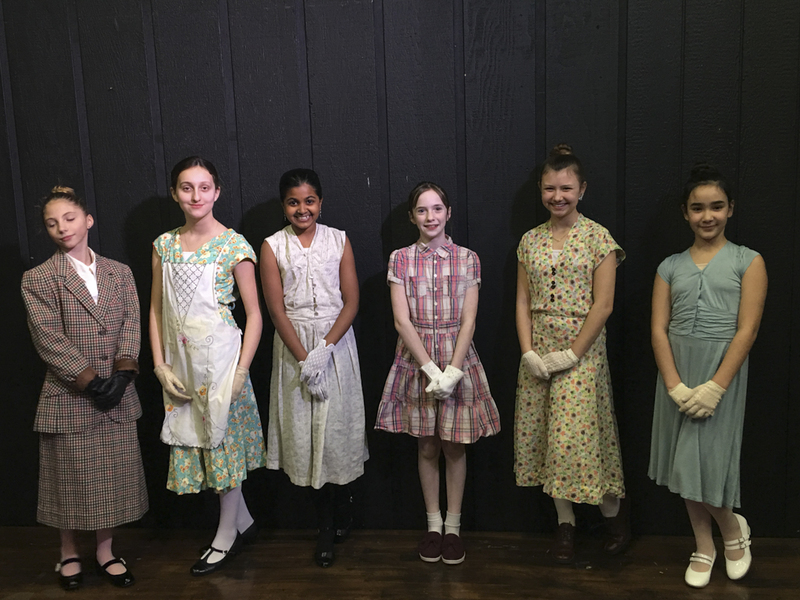 On February 13th the fourth and fifth graders performed their old fashioned, radio-style play for classmates and family members, alike. 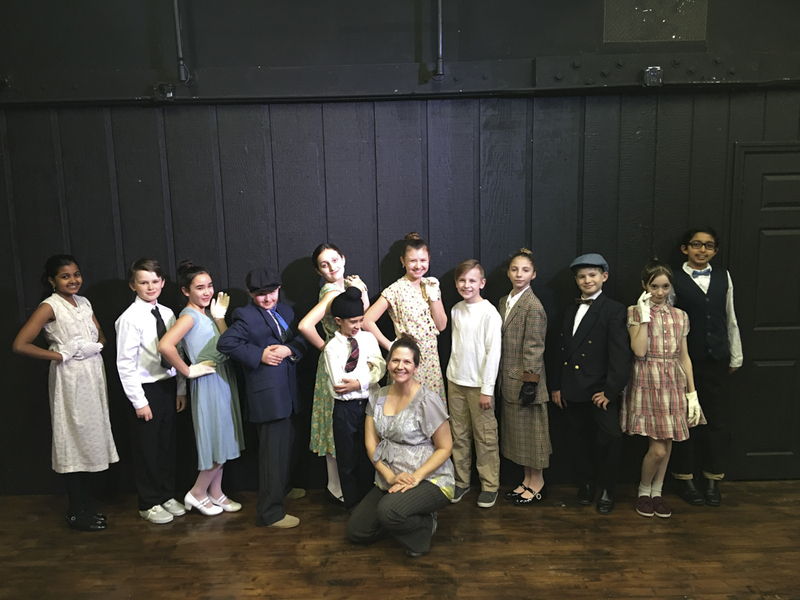 Entitled “The Museum Mystery Caper,” the students entertained audiences with humor, suspense, education…and of course a thrilling conclusion! 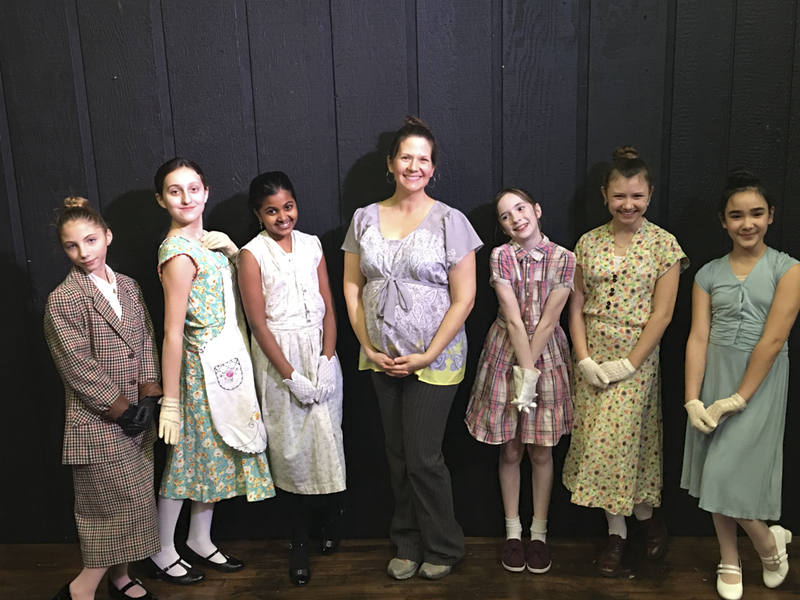 There were roles large and small, but all important and vital in their own ways. 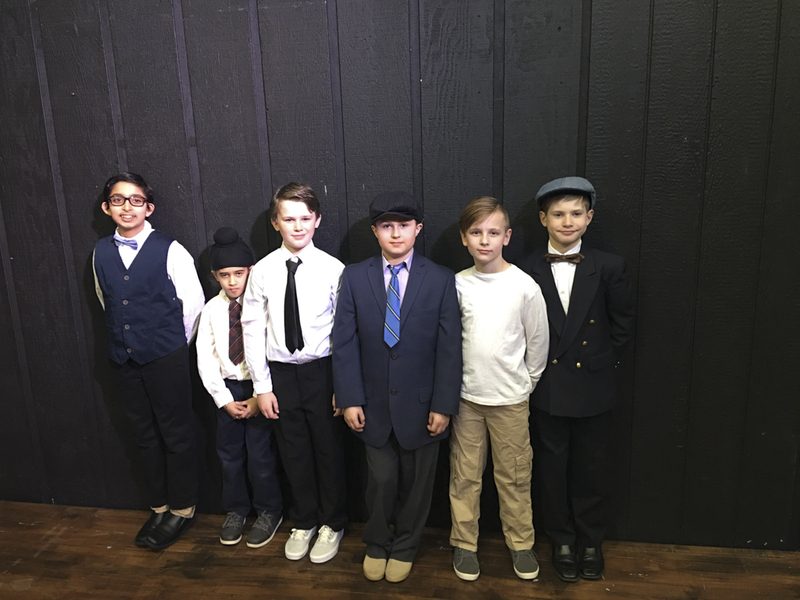 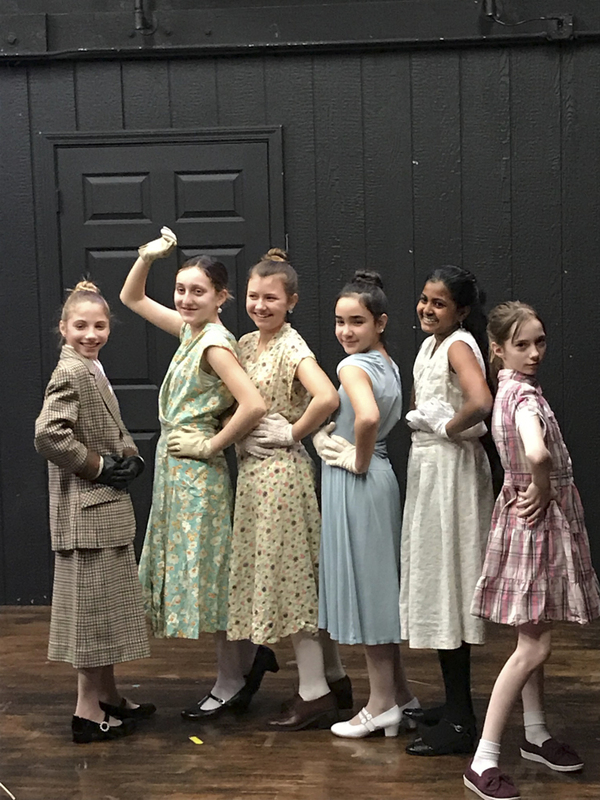 Musicians played a compelling introduction and accompaniment to the show, lighting crew created the mood, sound effects crew brought the story to life, the actors gave the performance its flavor and flair, and the props department created fun details to enhance the storyline. 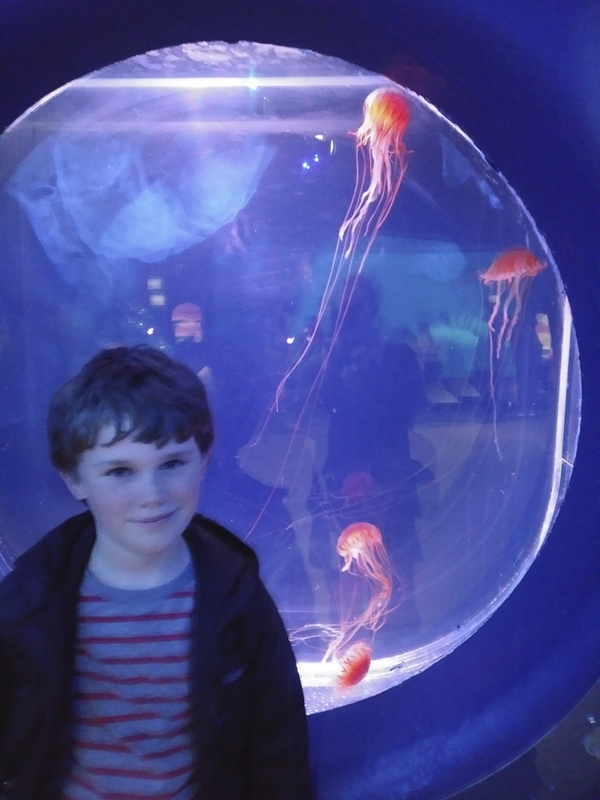 There was even a set manager, ensuring that everything ran smoothly from start to finish! 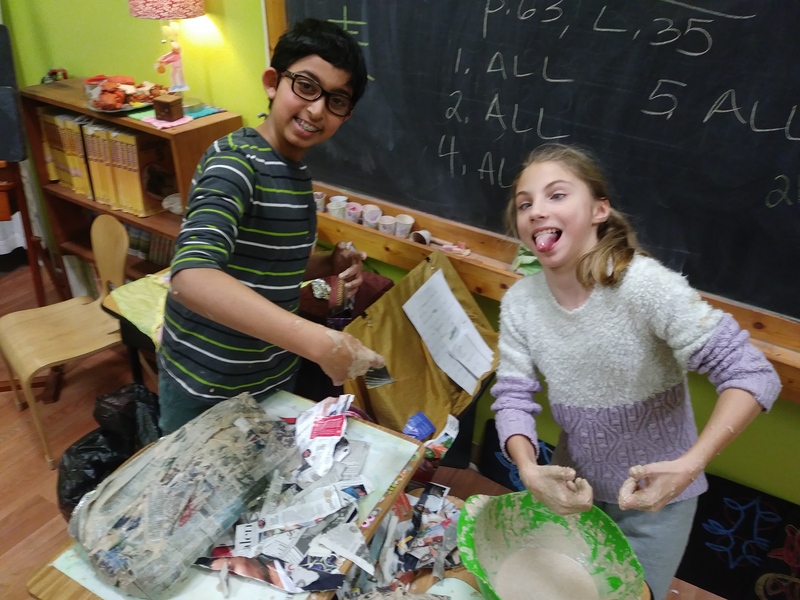 We all had so much fun that we (almost) forgot how hard we worked! 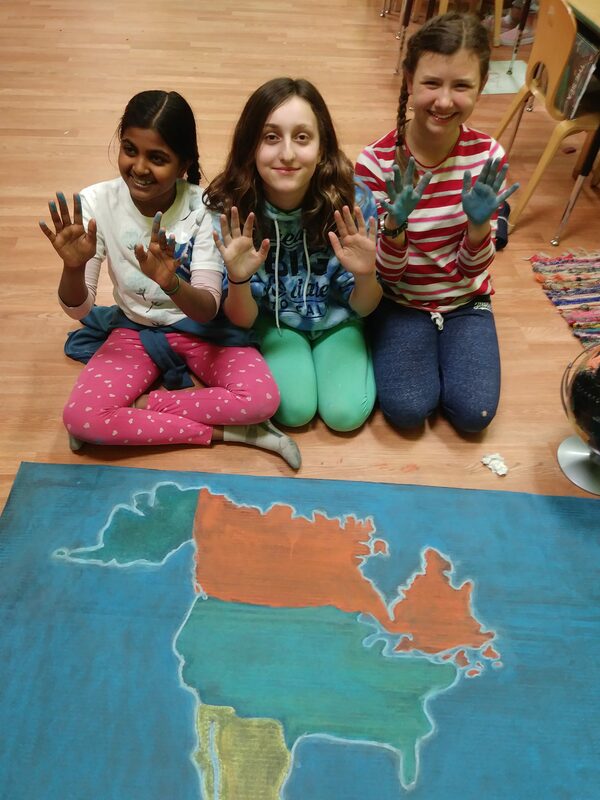 Extra special Thank Yous go to class parents Jennifer Nichols, Louisa Turnbull, and Neeru Kaur for helping before, during, and after the performances. 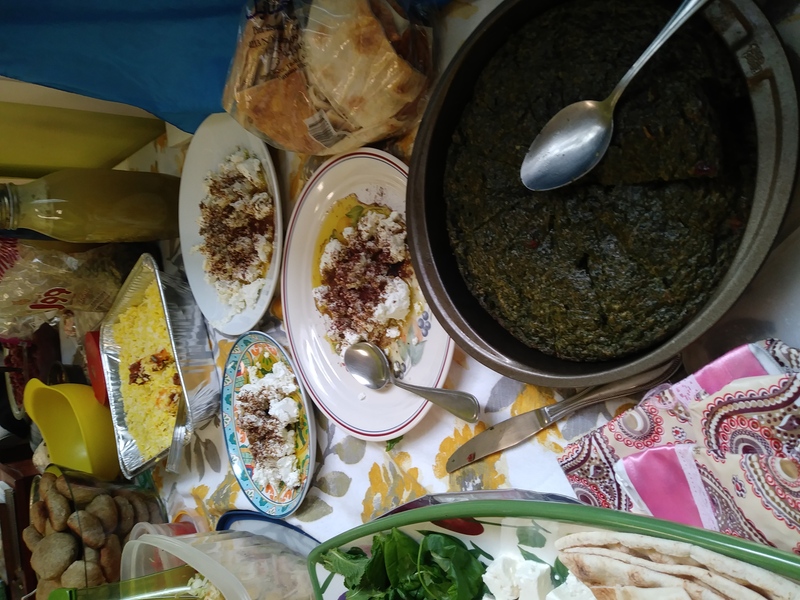 Our Ancient Mesopotamian Feast! 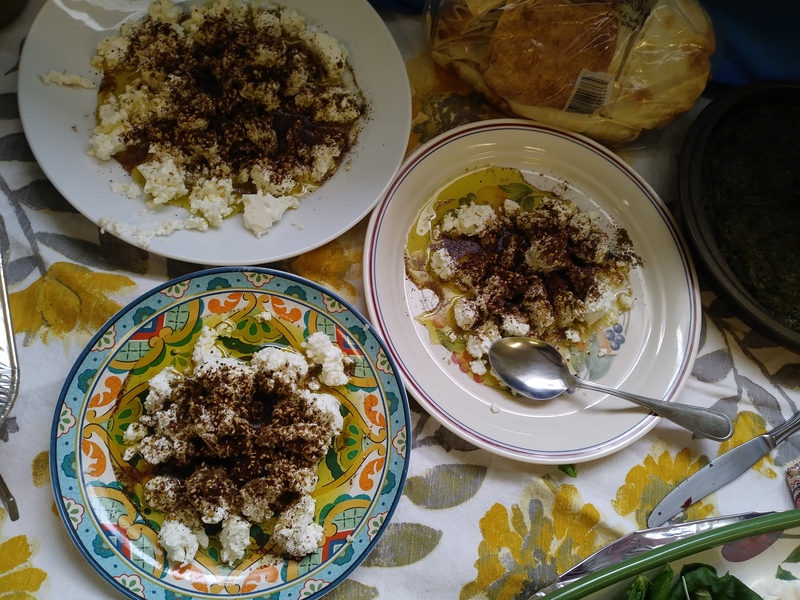 Each child was responsible for one dish, and made the food themselves! 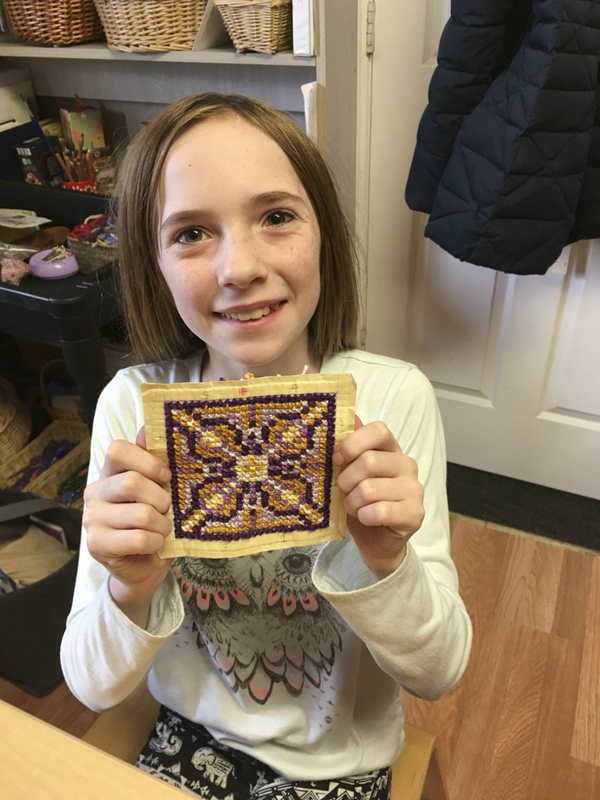 The fourth graders have done an impressive job on their cross stitch work this year. 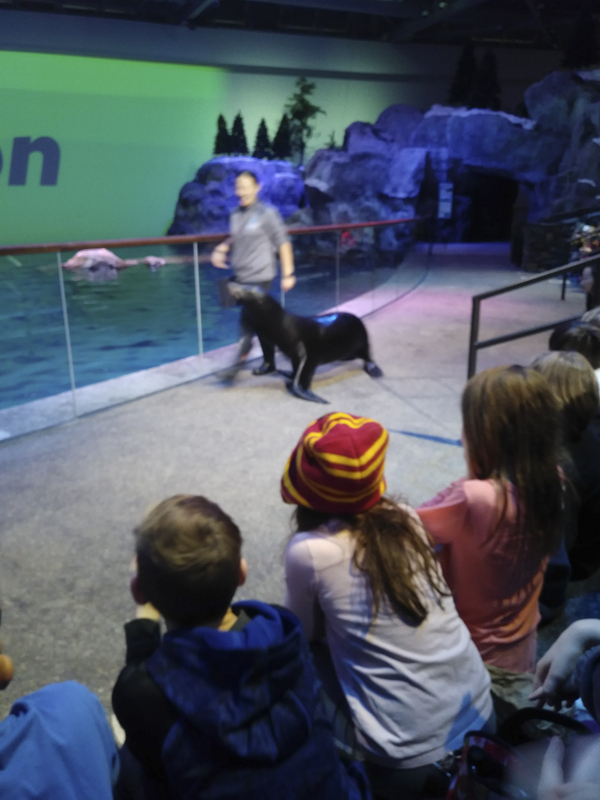 The fourth and fifth grades visited Shedd Aquarium on Friday! 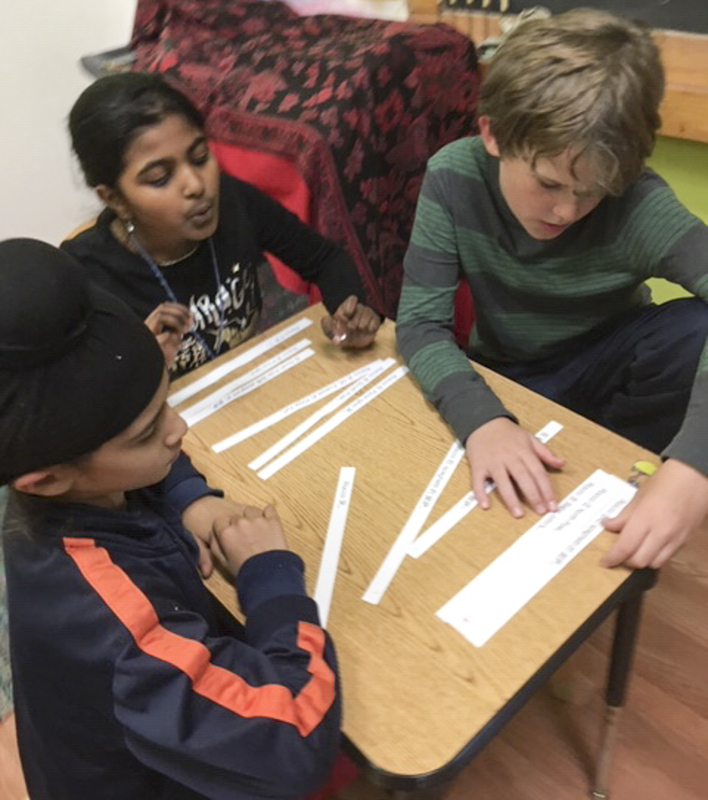 The 4th and 5th graders worked on reading comprehension in Mandarin class this week with their first long story. 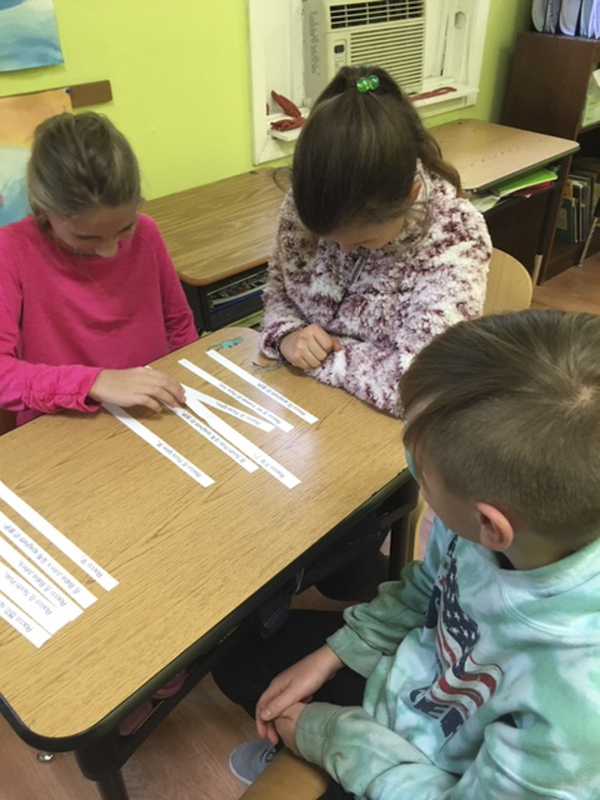 They put sentence strips in order to form a summary of their story. 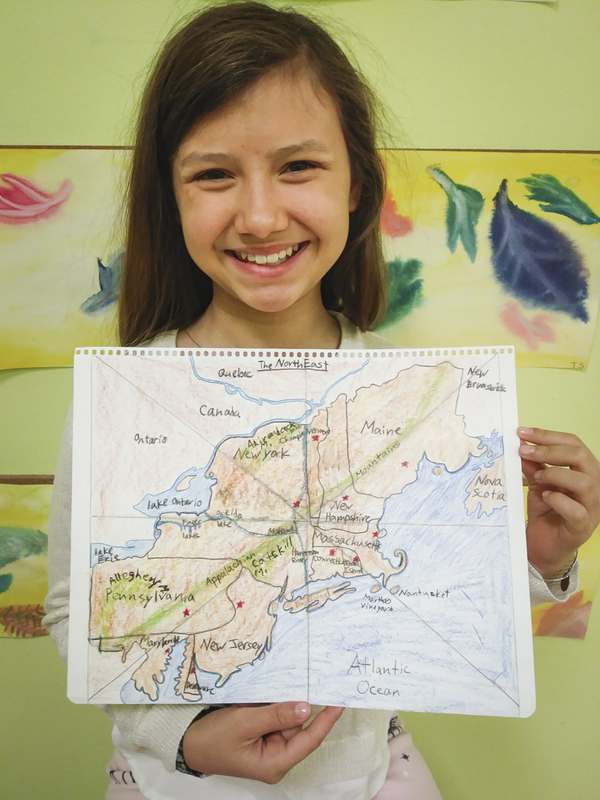 Fourth and fifth grade students are capping off their first blocks of study in geography this week. 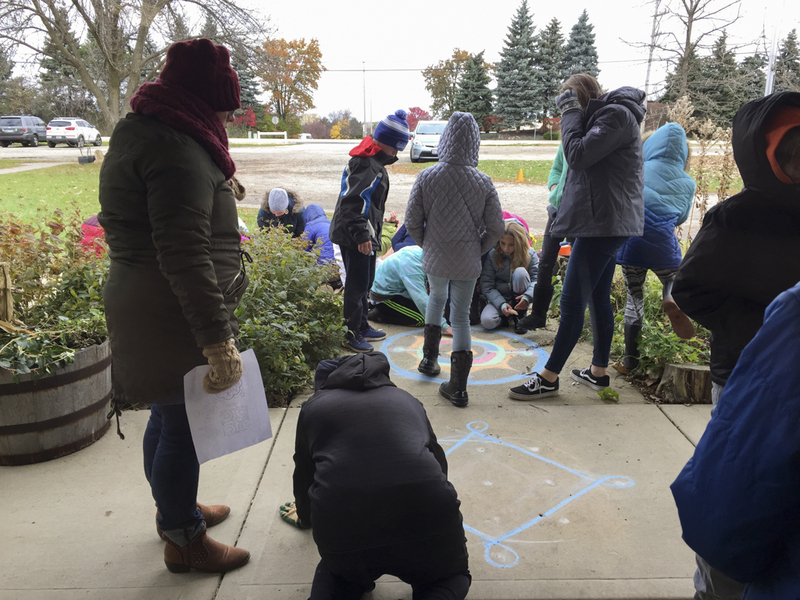 For fifth grade that meant delving into the study of North America, while fourth grade focused on Illinois, Lake County, and our region’s first inhabitants—the Potawatomi tribe of Native Americans. 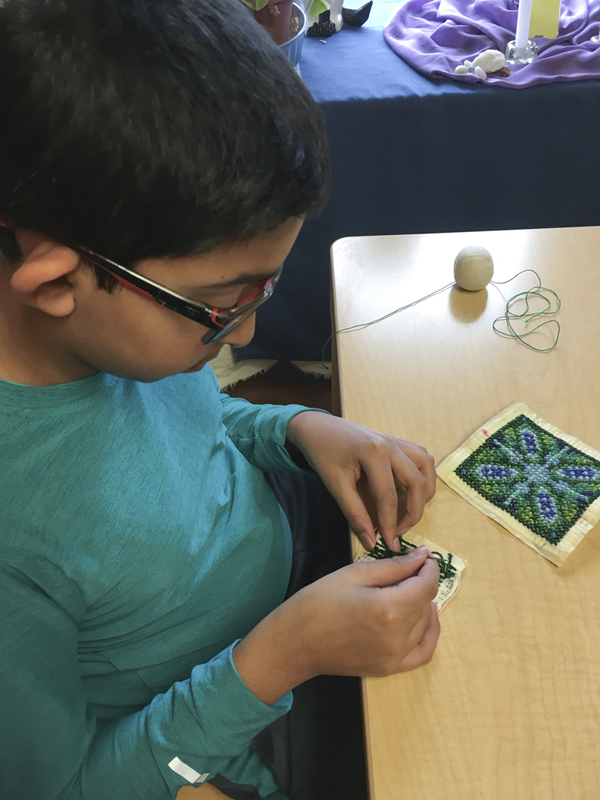 This week grades students celebrated Deepavali, or Diwali, the joyful Hindu festival of light. 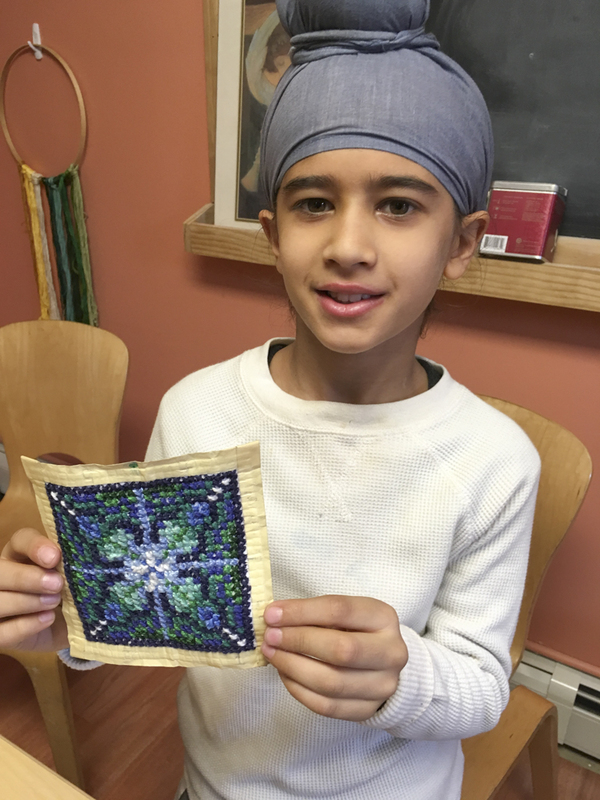 It was a beautiful reminder that other traditions and cultures have much to teach us and share with us. 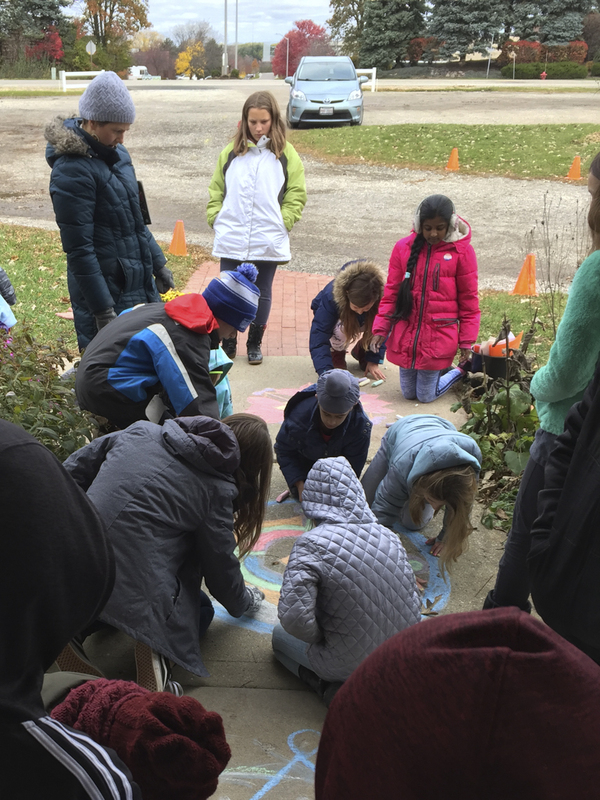 The 4th-8th grade students took Wednesday to create intricate rangoli outside our main entrance. 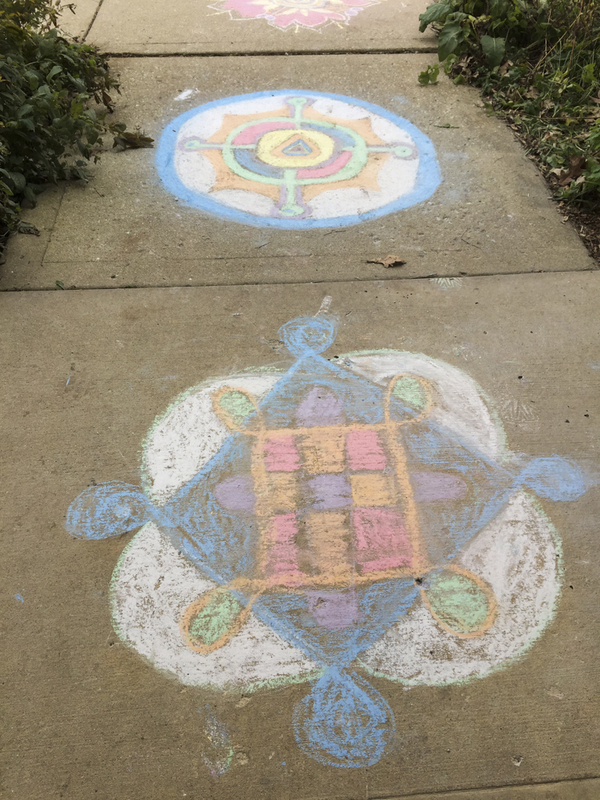 Rangoli are a traditional part of this celebration and are usually created using rice powder, turmeric and kumkum powders. 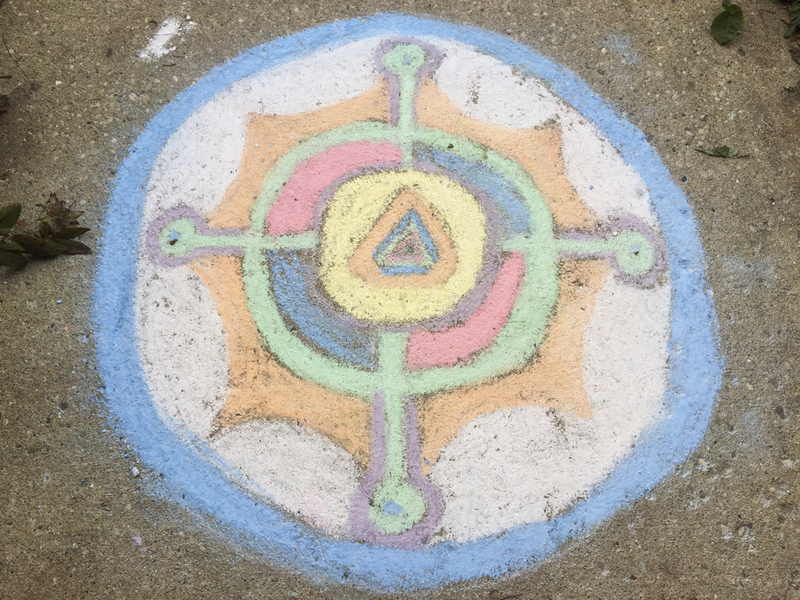 After practicing the forms we were going to create, we used chalk to draw these beautiful freehand geometric designs. 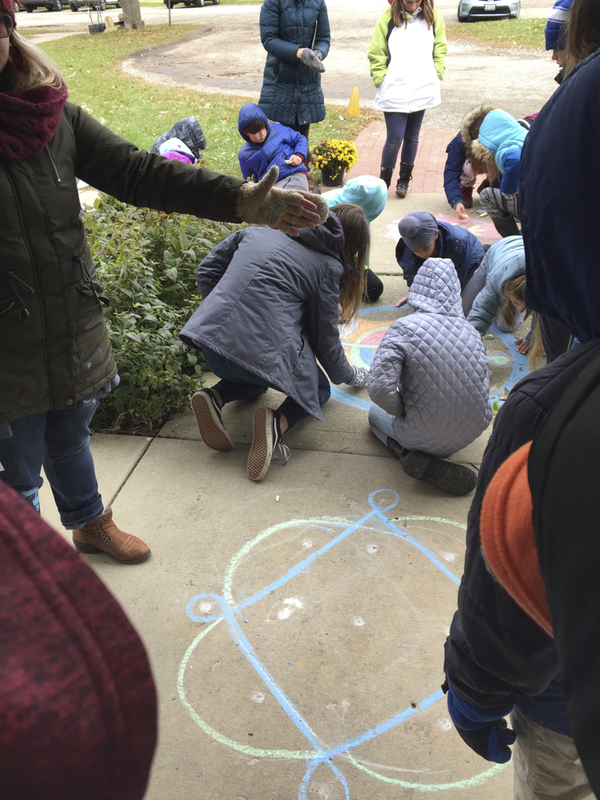 At Thursday’s all-school assembly, however, we were treated to a beautiful rangoli created by parent and early childhood assistant Sweta Jaganath. 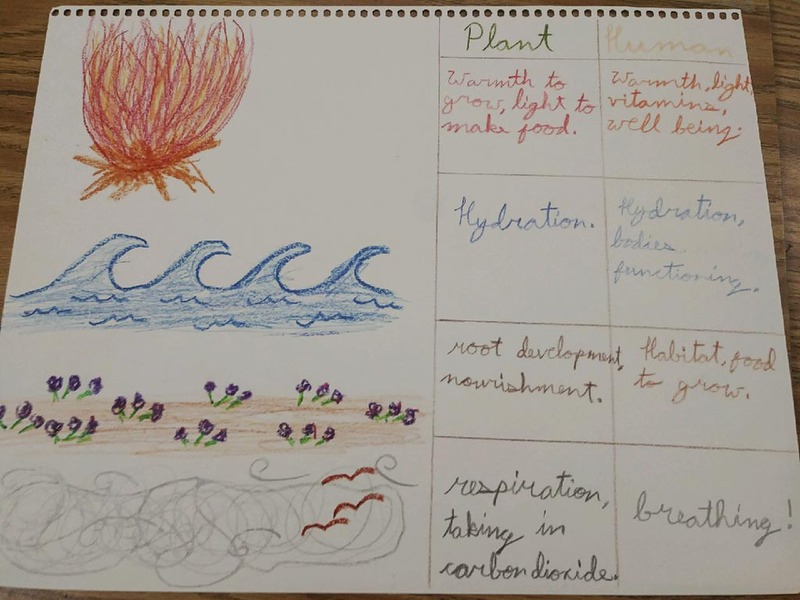 This example was made using the traditional method and materials. 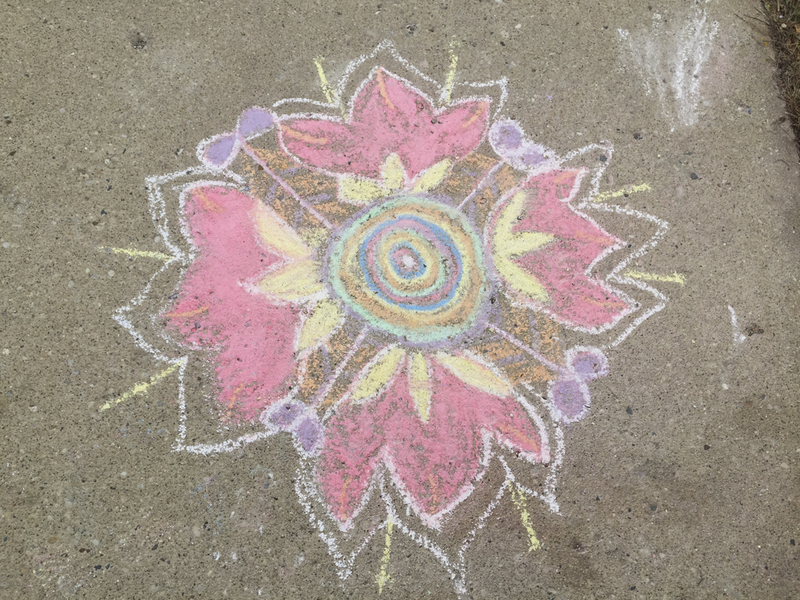 She surrounded the colorful design with many candles, representing the diyas, or lamps, used in India. 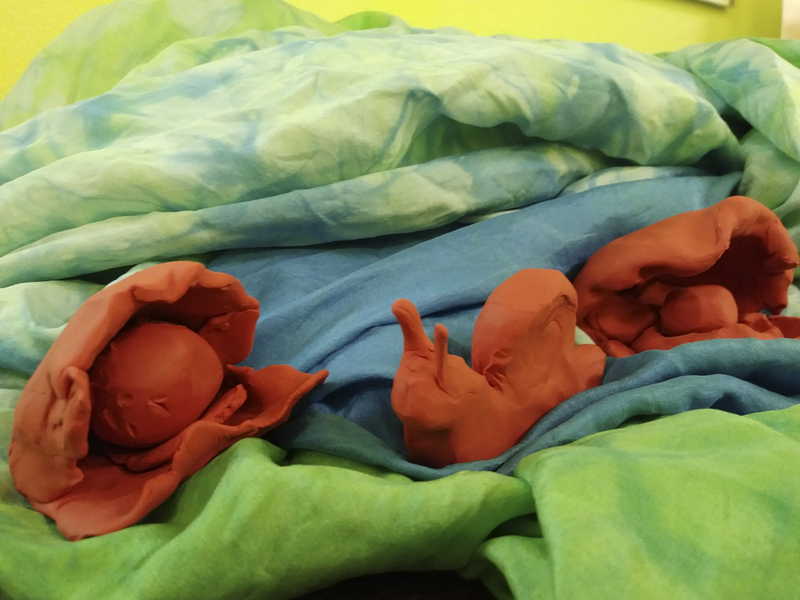 During assembly we also heard the story of Rama and the demon king Ravana. 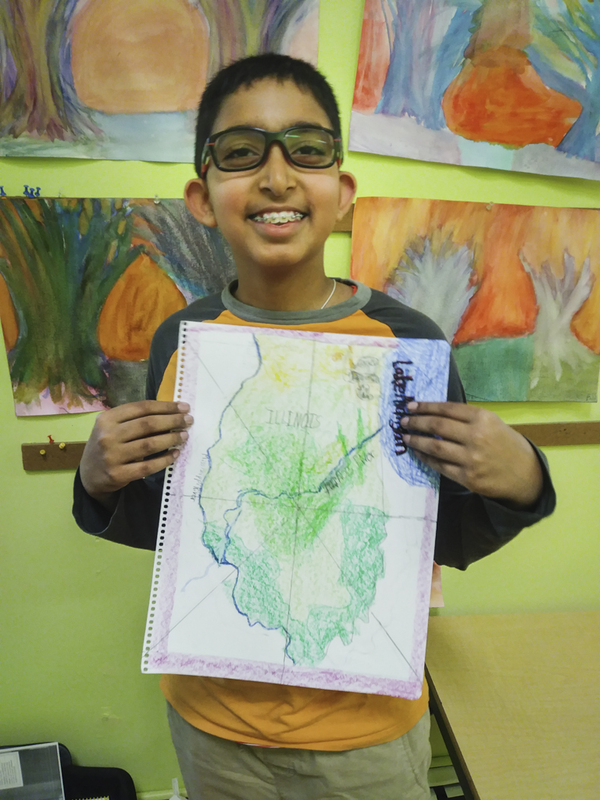 This important story forms the heart of the Ramayana, India’s cultural treasure of an epic poem. 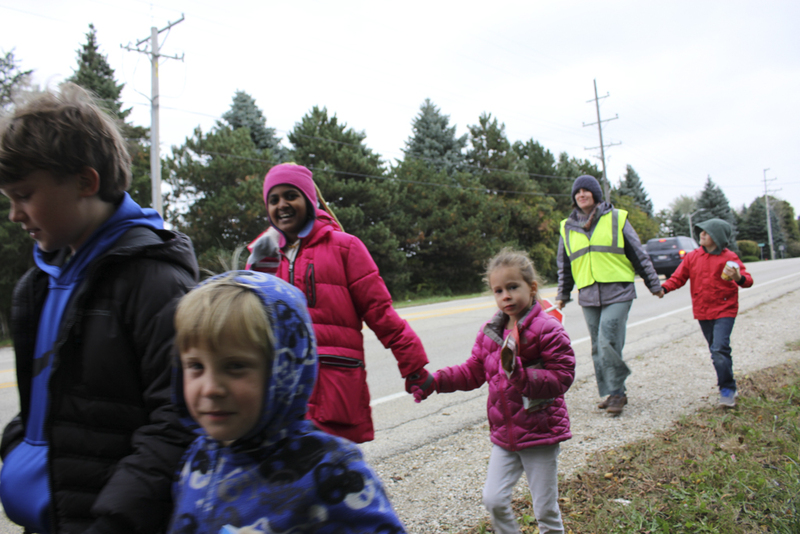 It also forms the heart of Diwali, for when Rama destroys Ravana—and good prevails over evil—Rama returns home to find a joyous welcome created by thousands of lit diyas and many decorations to celebrate his return. 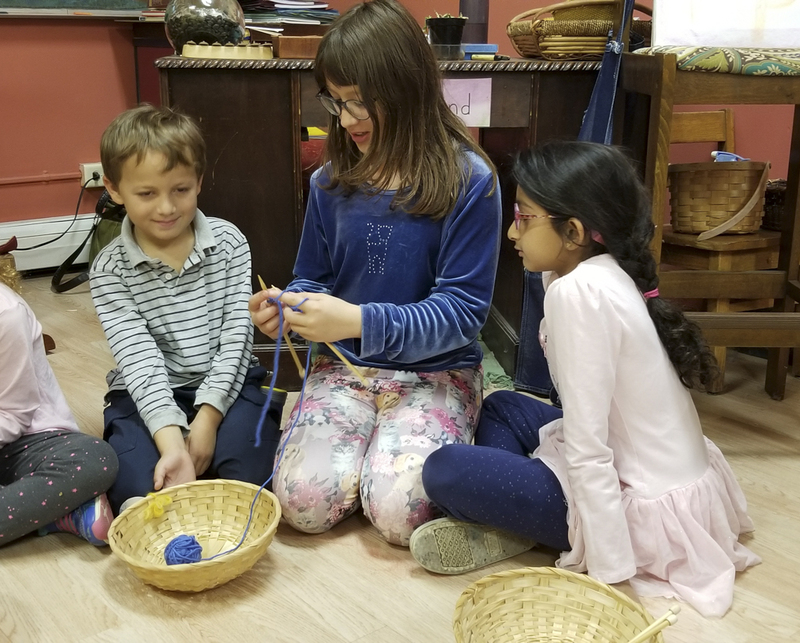 Students finished the morning by working together to craft their Martinmas lanterns for Friday’s lantern walk. 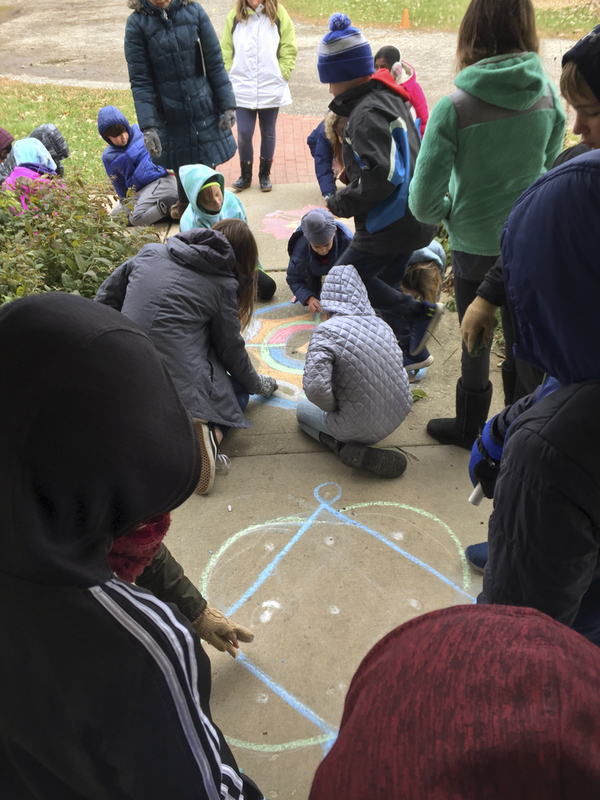 These overlapping festivals, both celebrating our own light in the darkness, prepared us well for the beauty of the season ahead. 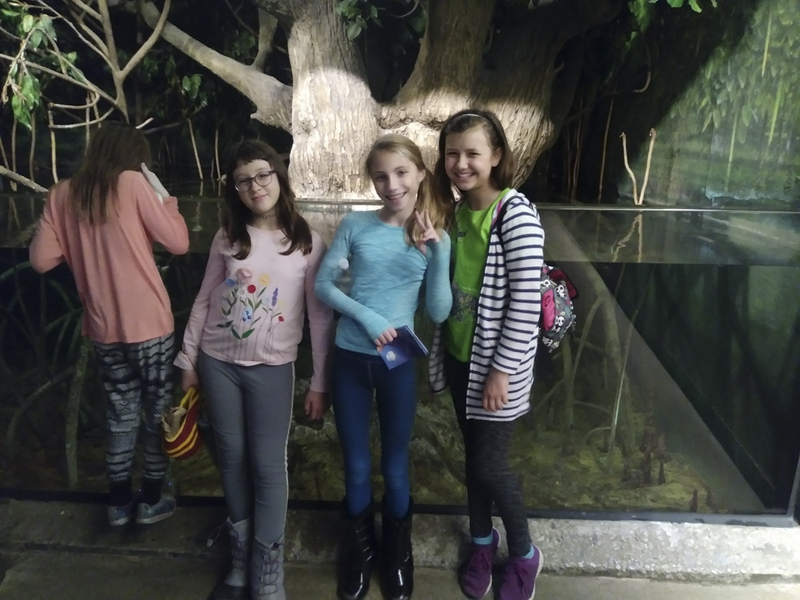 The fourth and fifth grades ventured to Stevens Point, WI last week for their first class trip together! 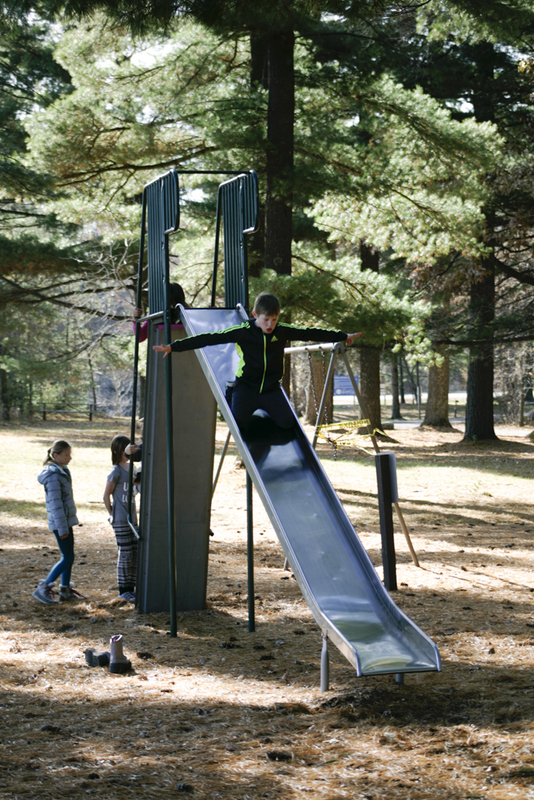 They lodged in a simple county park structure complete with a toasty wood stove. 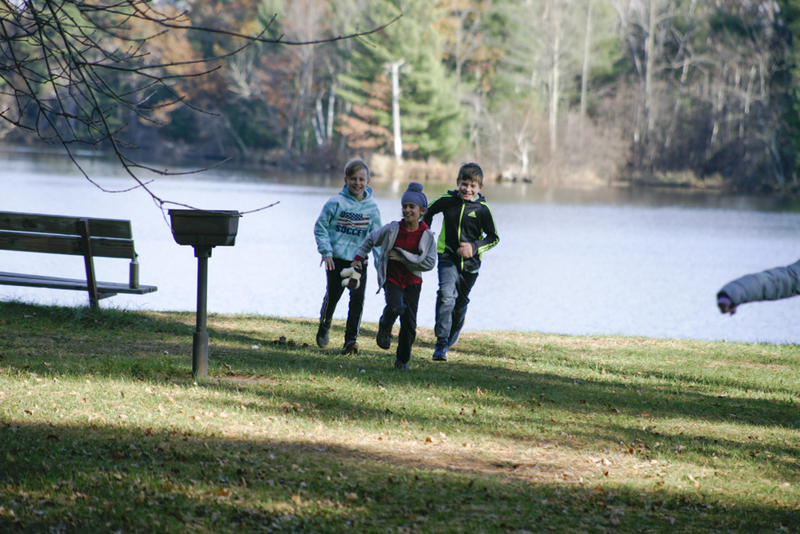 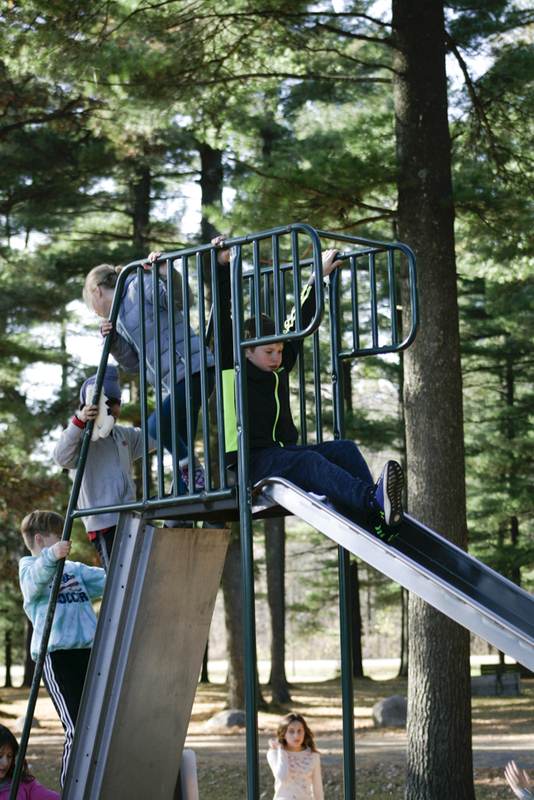 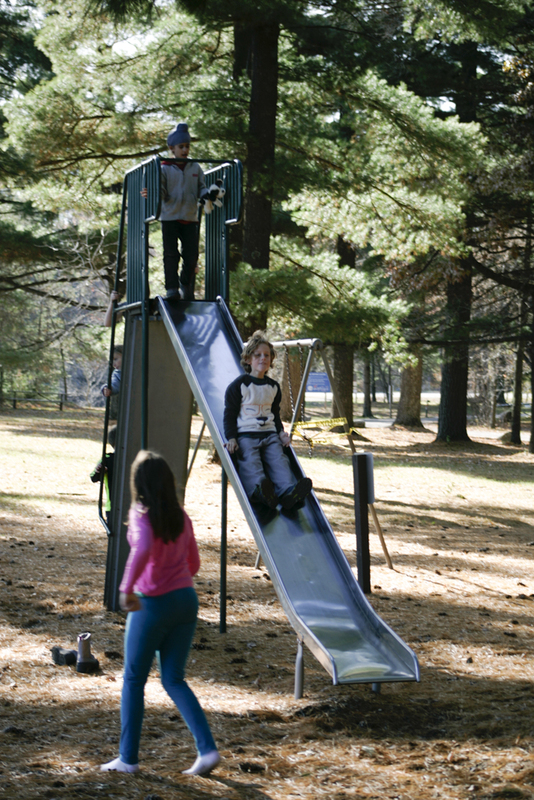 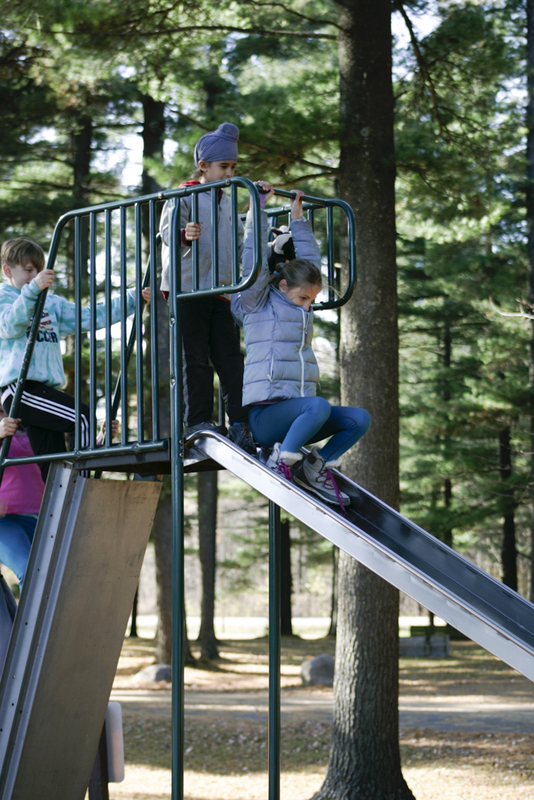 The beautiful, wooded surroundings provided a lovely backdrop to hike, play and explore. 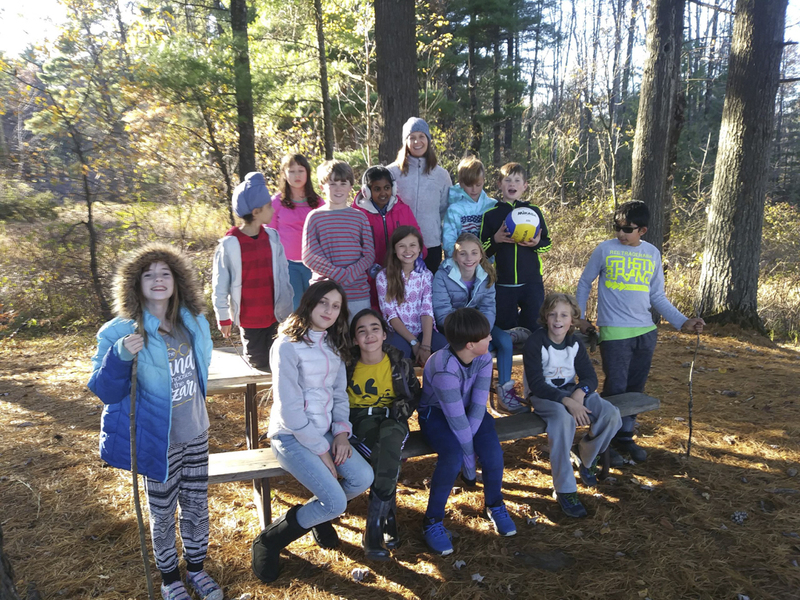 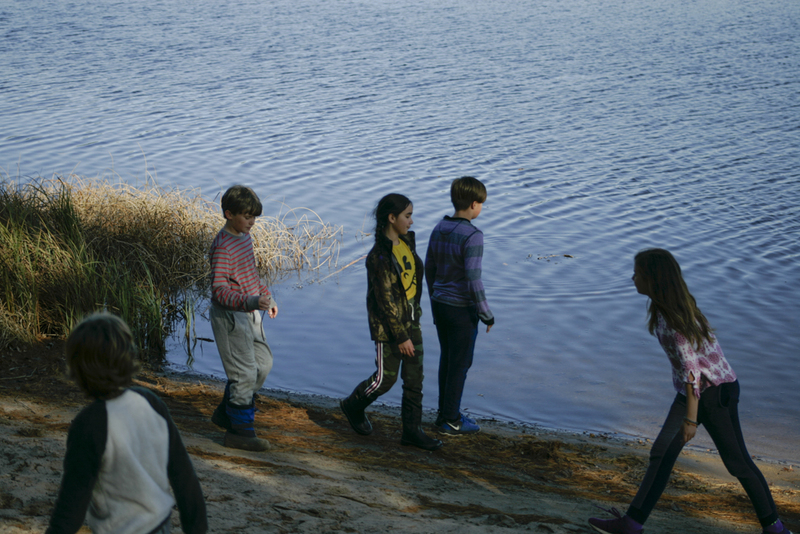 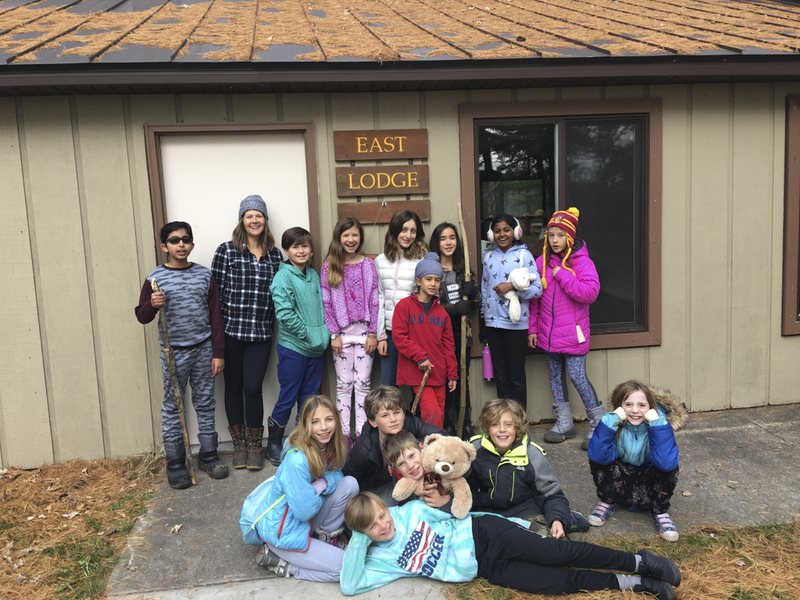 Fifth grade especially enjoyed our nature hikes as the woods were the perfect place to hunt and discover many of the plants we studied in our Botany block, including ferns, lichen, moss, and many species of trees. 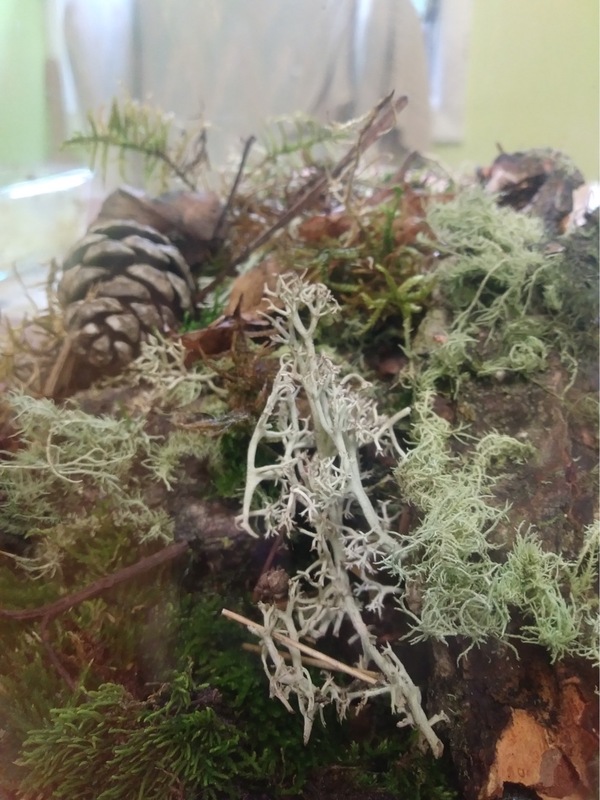 From one hiking spot we could look out and count 8 different species of trees! 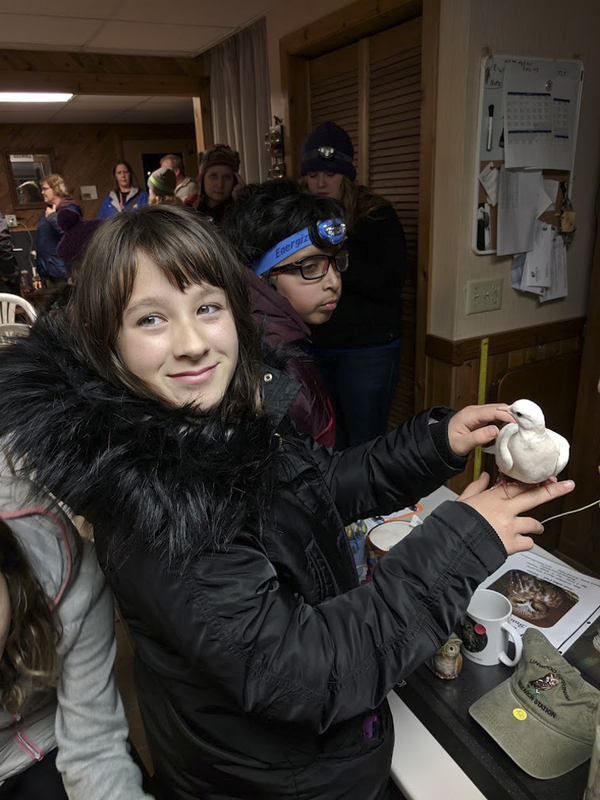 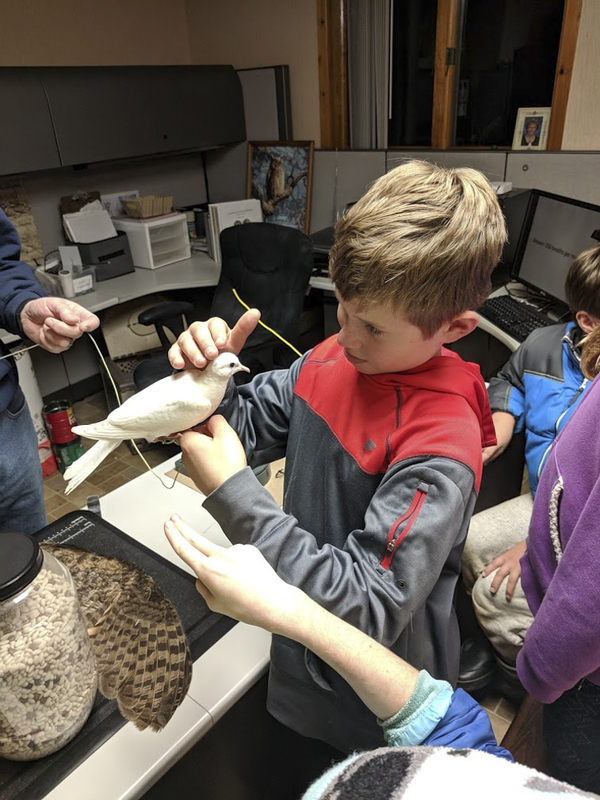 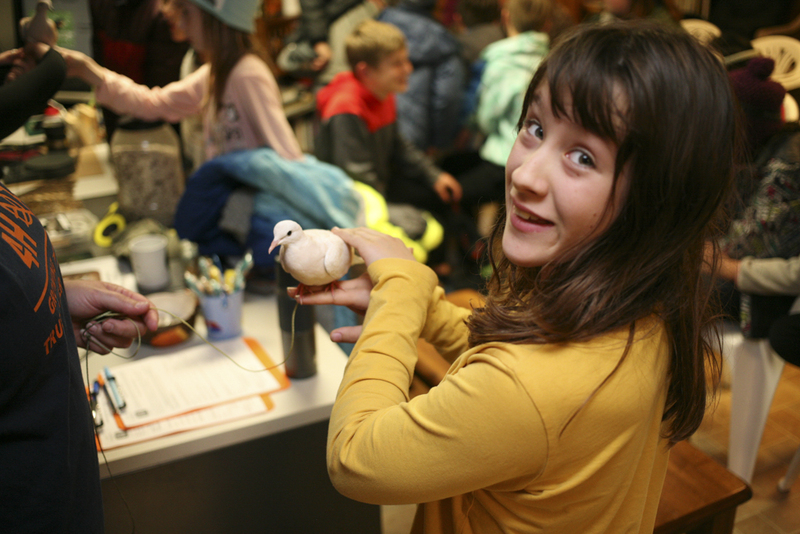 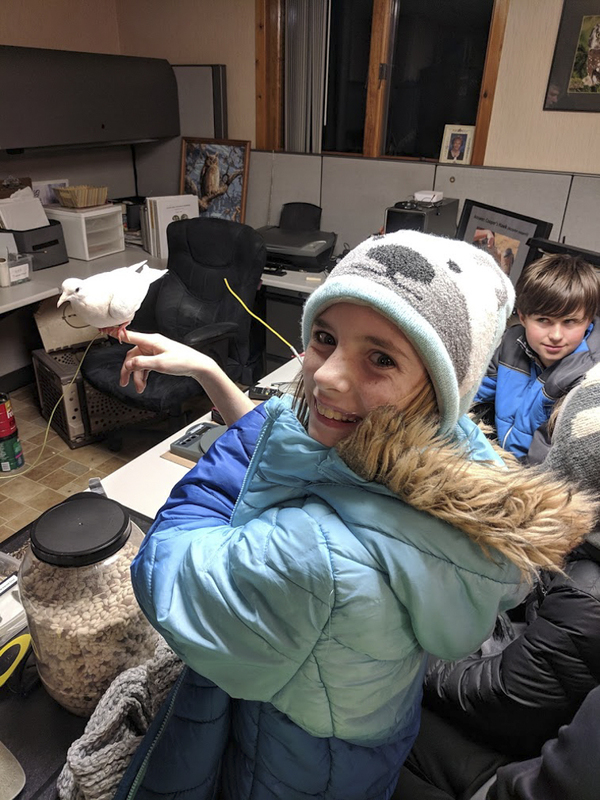 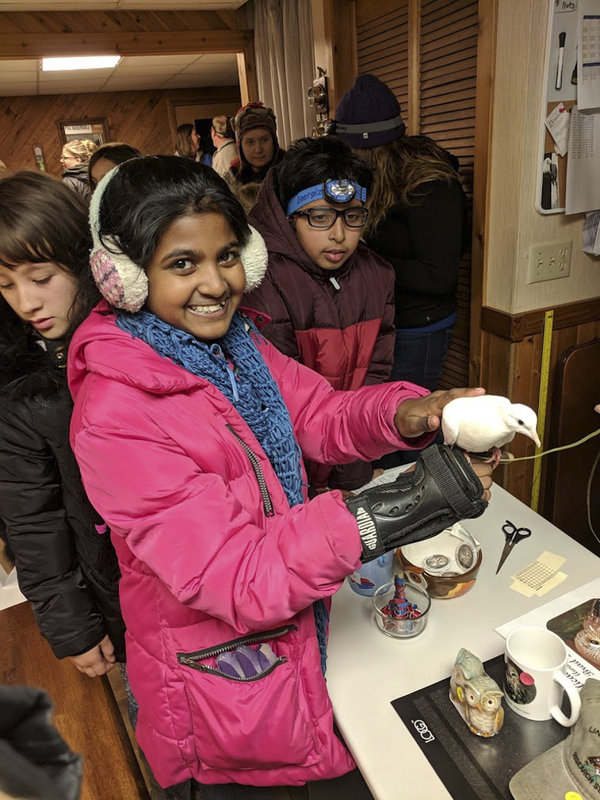 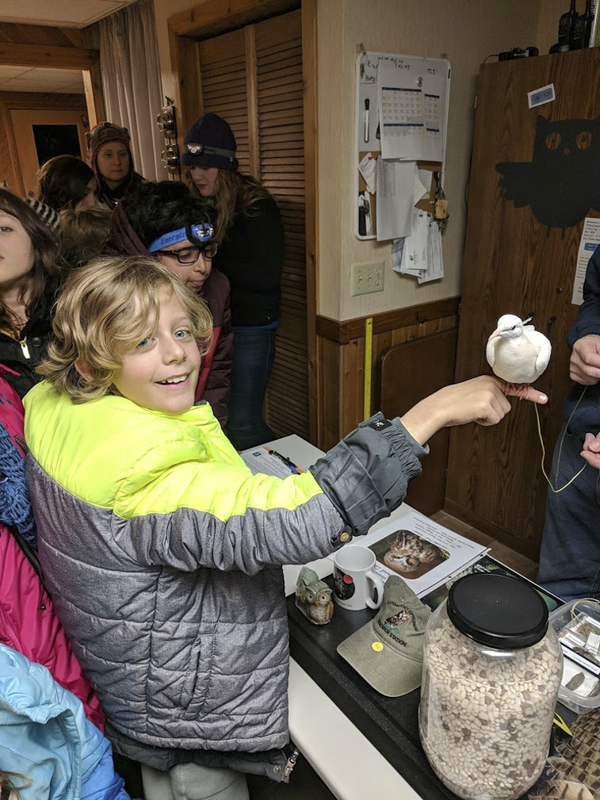 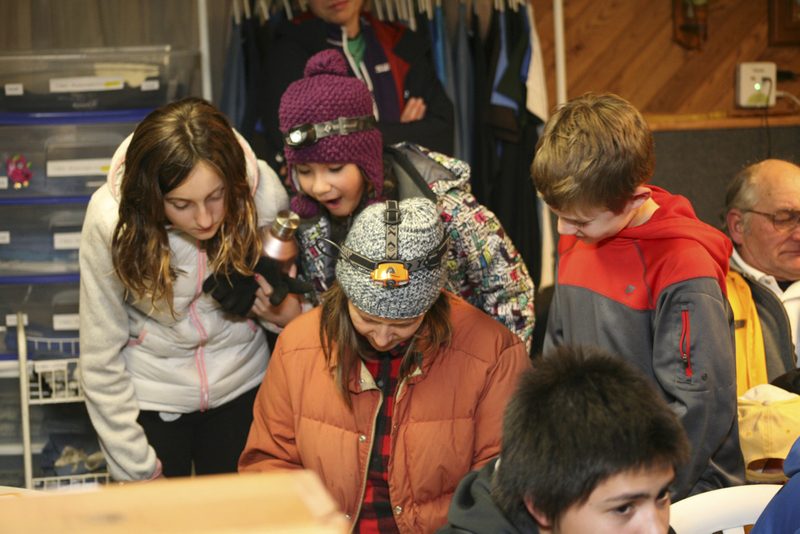 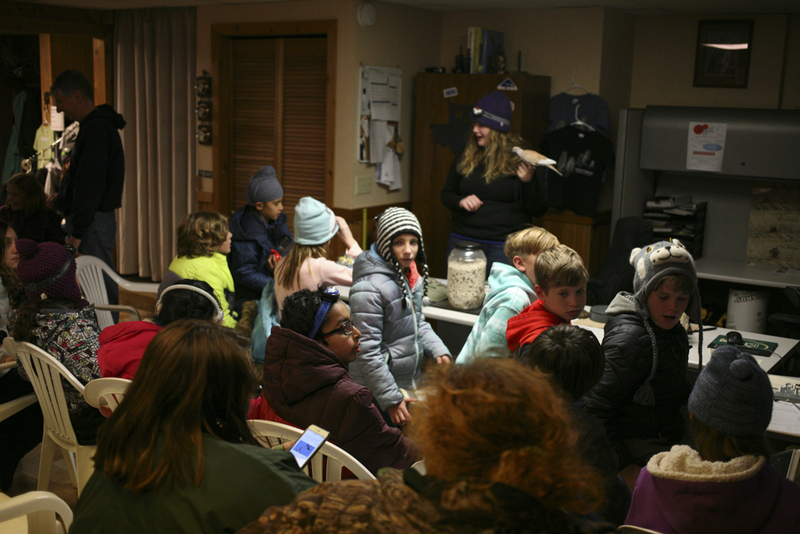 The fourth graders were able to use the wealth of information learned in our Human and Animal block to enjoy the highlight of our trip: visiting a raptor research center which nets, bands, and studies saw-whet owls. 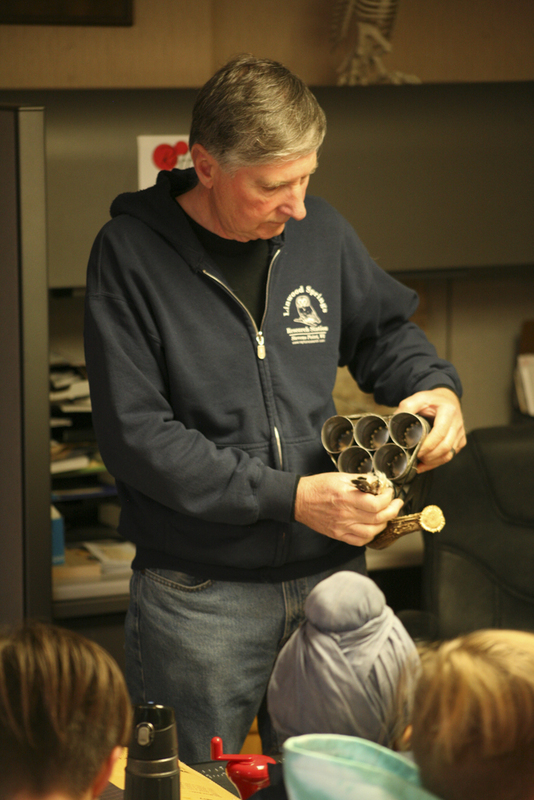 Mrs. Westlund was proud of the students as they interacted with the director of the center, Gene Jacobs, answering many of his questions about owls. 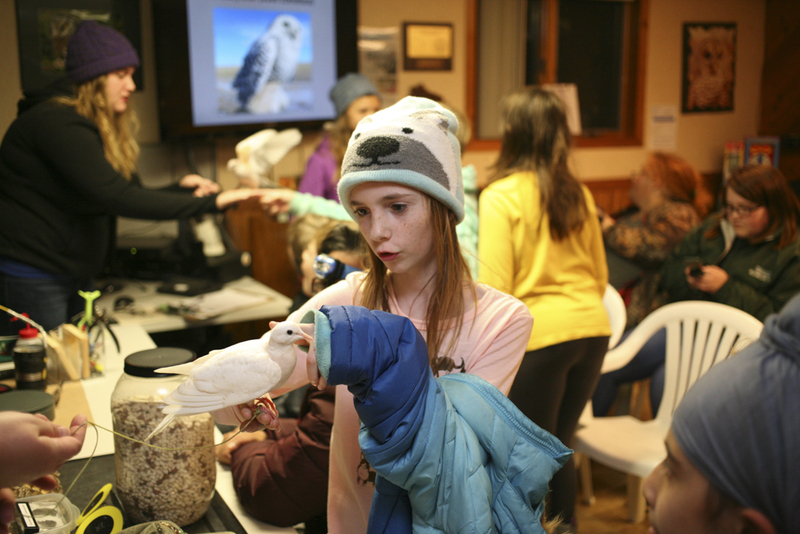 *Do you know how far an owl can turn its head? 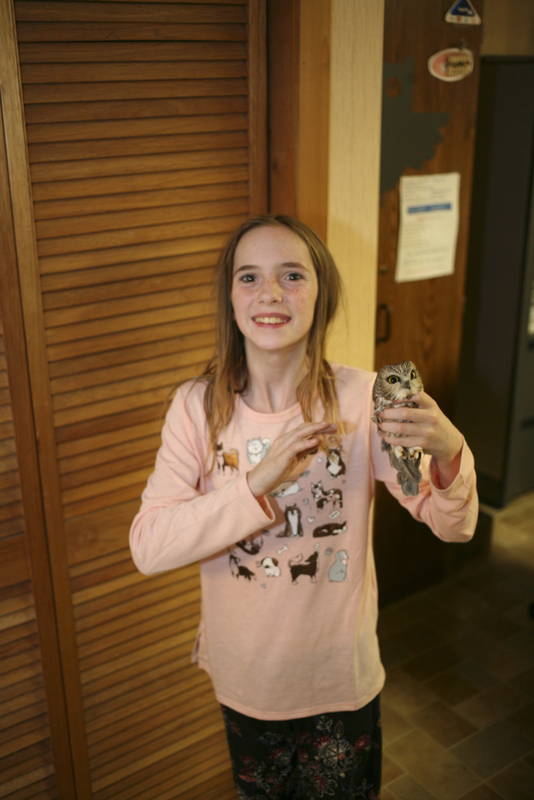 **How many times more vertebrae does an owl have in its neck, compared to a human? 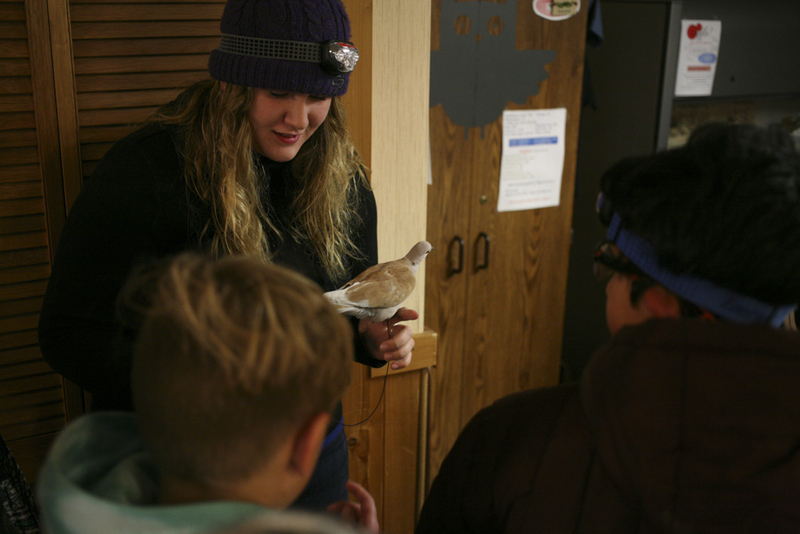 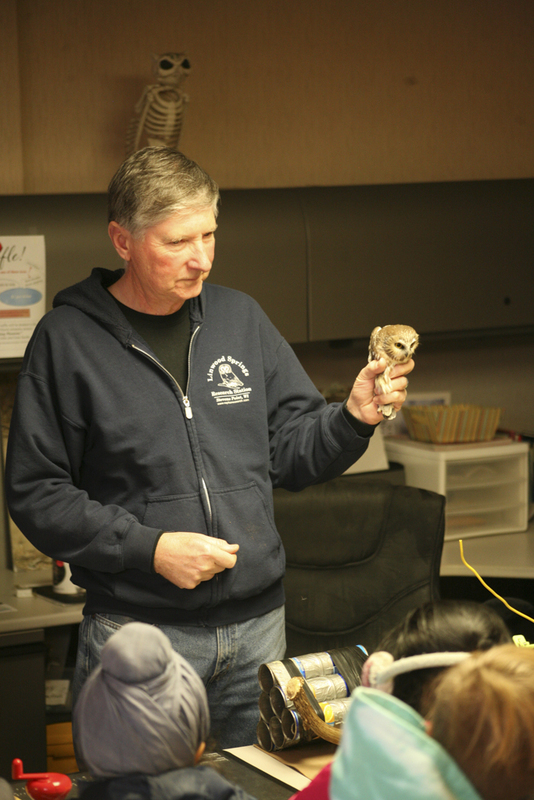 Each student was able to hold a tiny owl for an up-close experience of this beautiful animal. 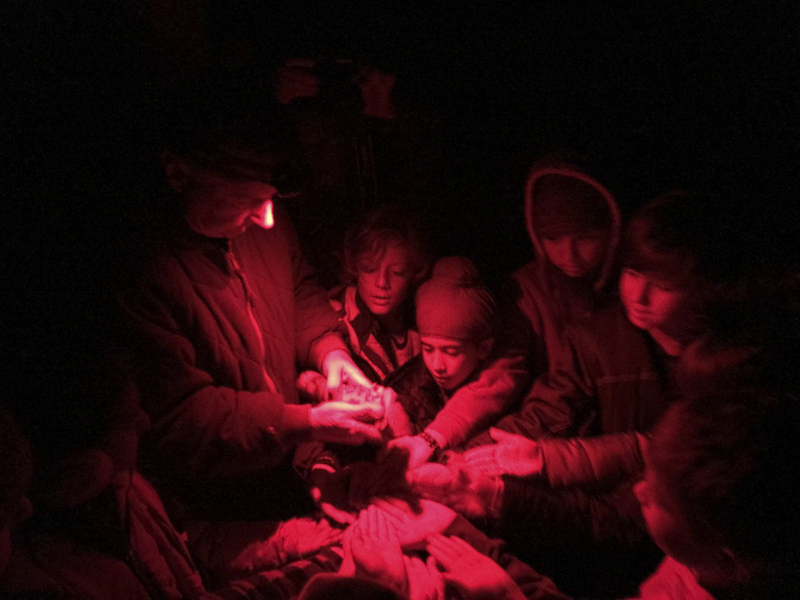 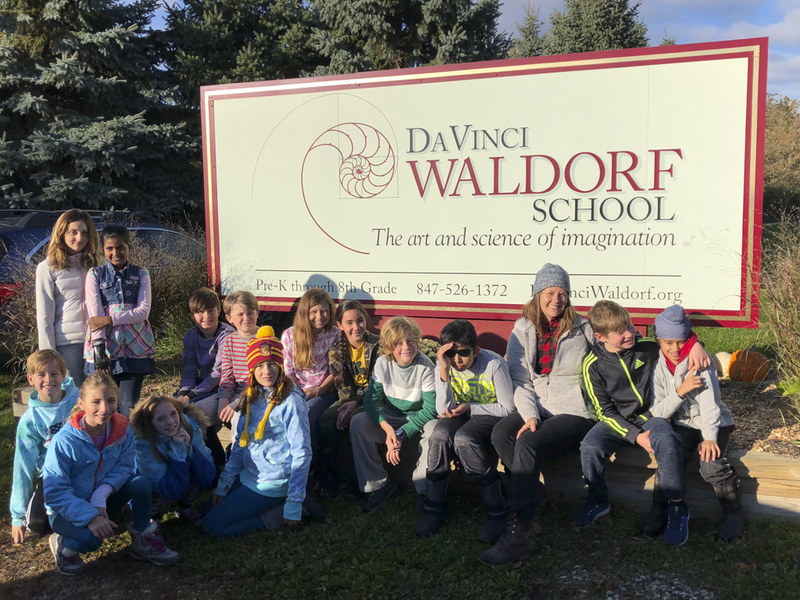 The evening concluded with our class accompanying Mr. Jacobs outside to the woodland edge where together, we released an owl back to its habitat. 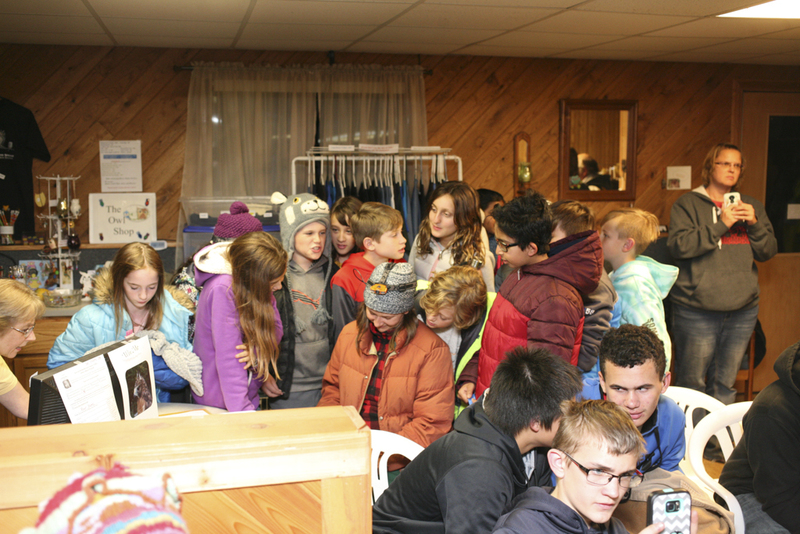 It was a very memorable experience for all! 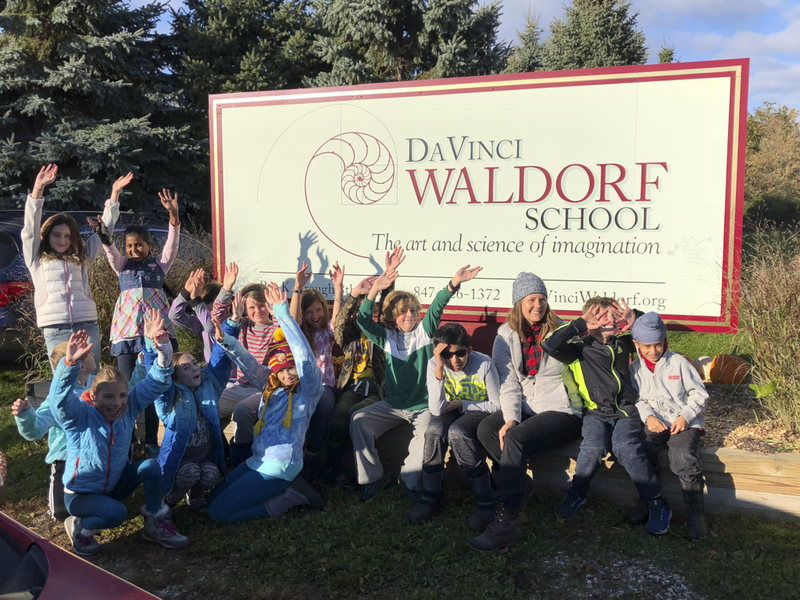 Many thanks to our parent chaperones, Rob and Nicole Sherman and Jen Nichols for joining us on the trip, and to Rob and Nicole Sherman, Jen Nichols and Luisa Turnbull for the many wonderful photos! 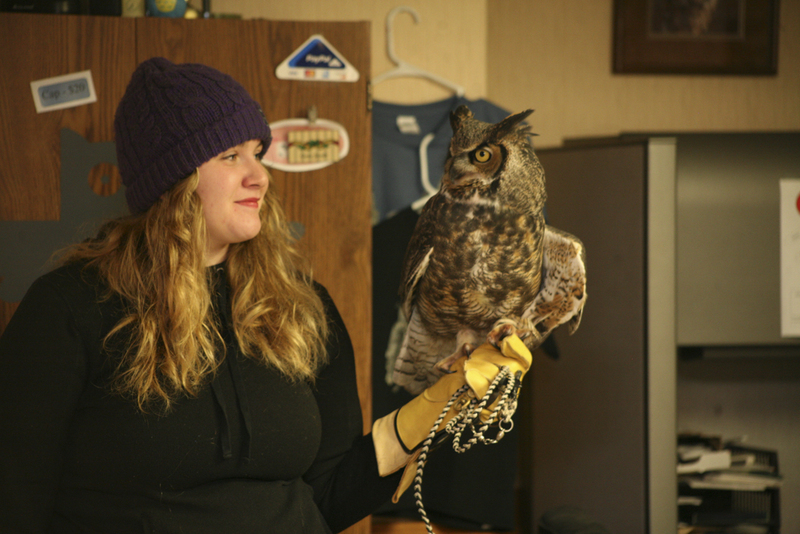 **Owls have twice as many vertebrae as humans! 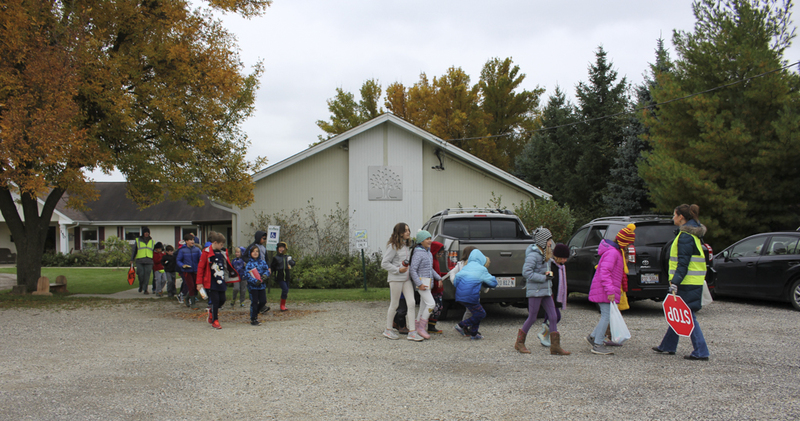 Each Thursday morning the grades classes gather for assembly and share with each other items from their curriculum. 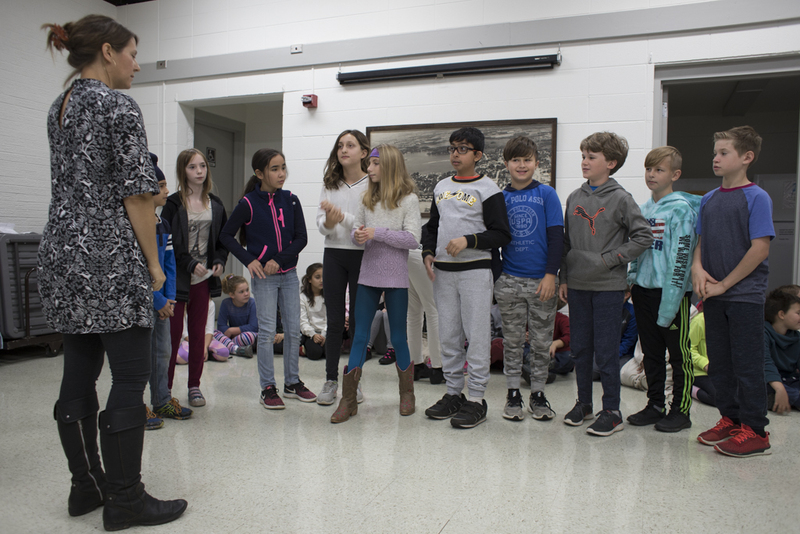 This week fourth and fifth grade sang a song about Buddha from their Ancient India block. 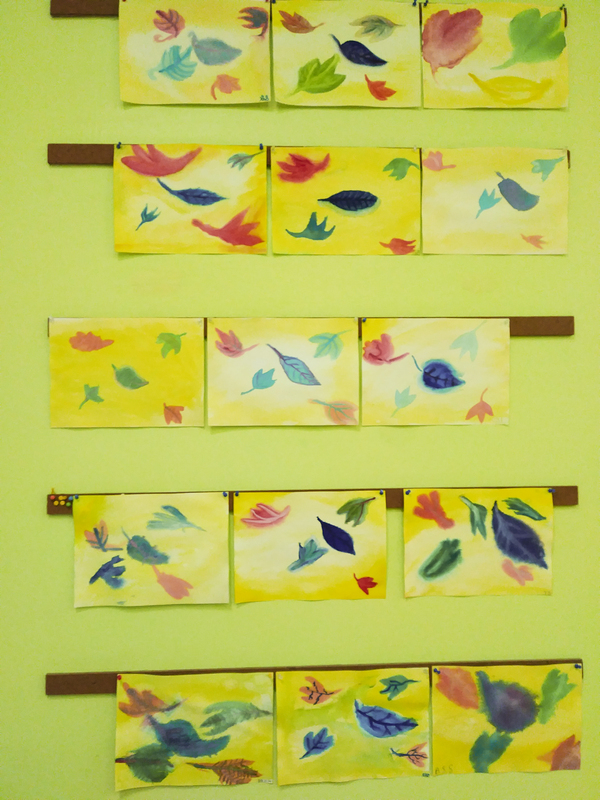 Autumn is falling in Fourth and Fifth Grade with their vibrant watercolor paintings. 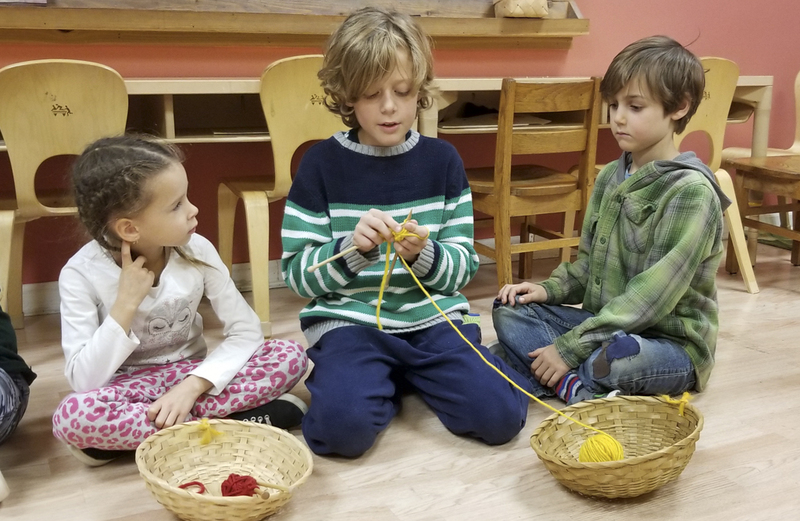 Last week was the first knitting day for the first graders. 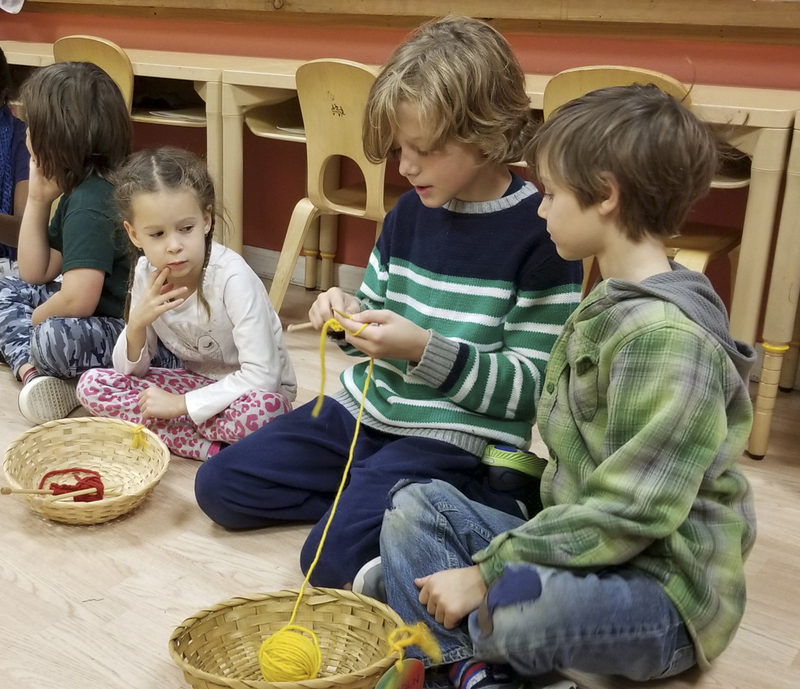 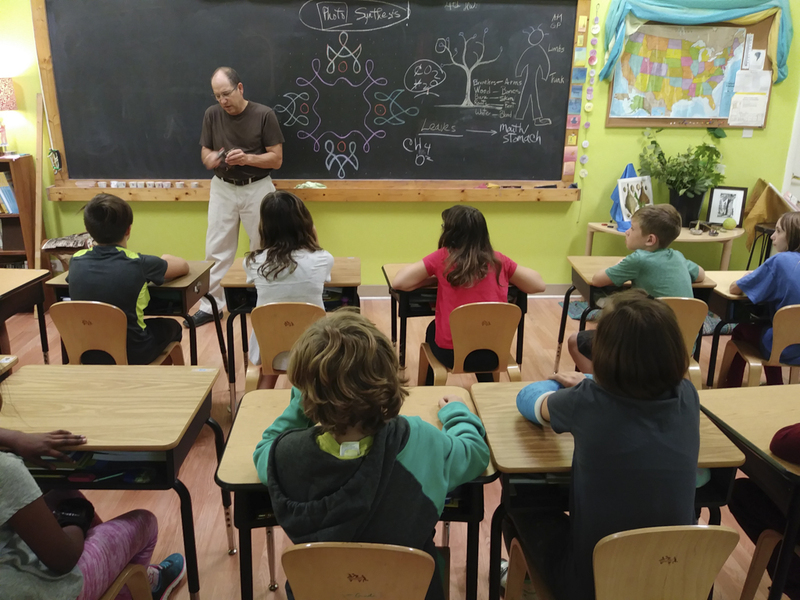 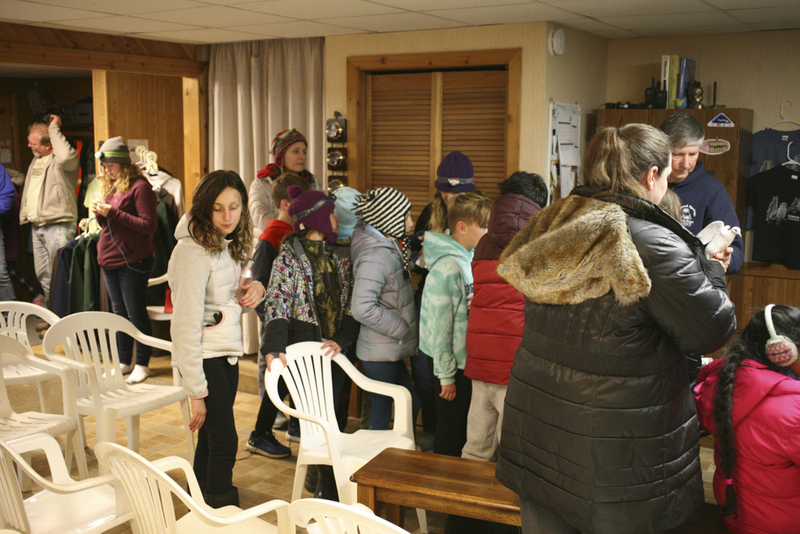 A lovely tradition of Waldorf schools across the world is that each year the fifth graders bring the very first stitches of knitting to the first graders. 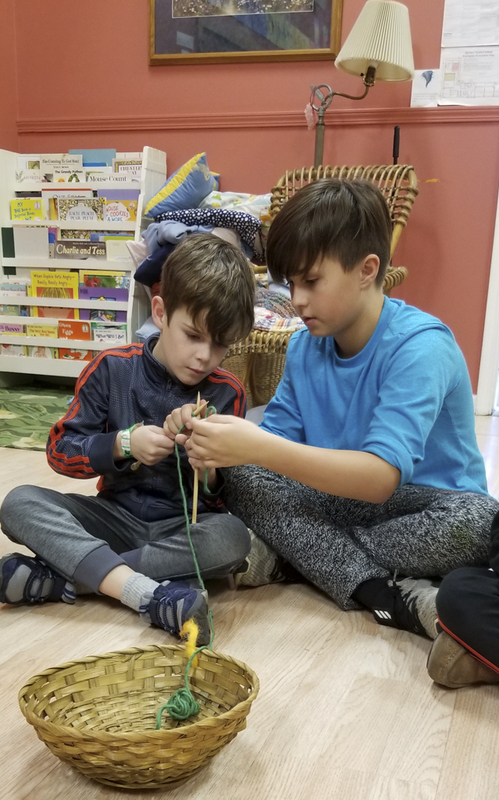 It is a beautiful pairing because fifth graders are returning to knitting for the first time since second grade, and are knitting socks at the same time the first graders are seeing knitting for the very first time. 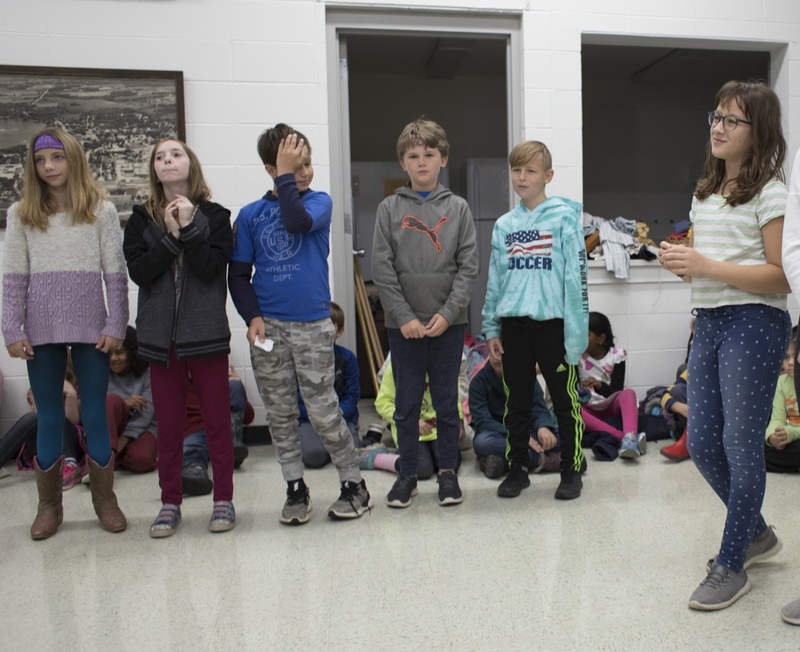 The little ones look forward to their time with the big, golden fifth graders, and it brings to the foreground a wonderful, warm part of the fifth graders as well, as they nurture the first graders through this process. 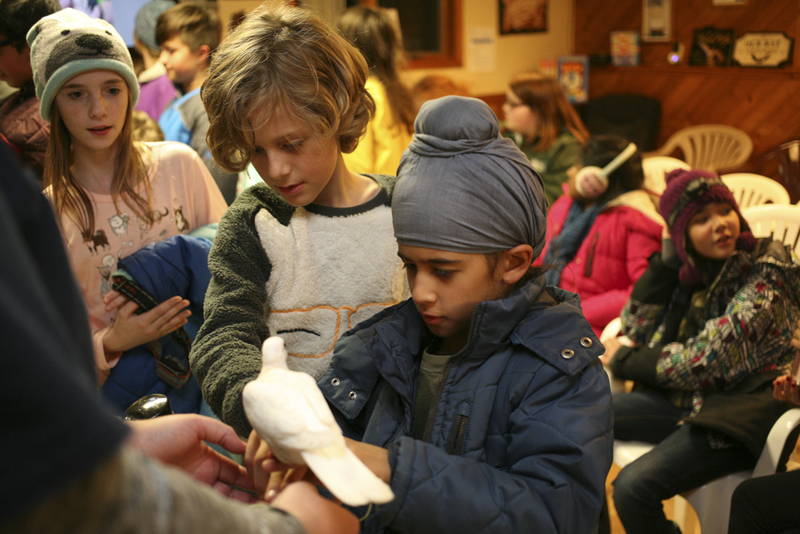 The passing on of knowledge is a moving, magical moment! 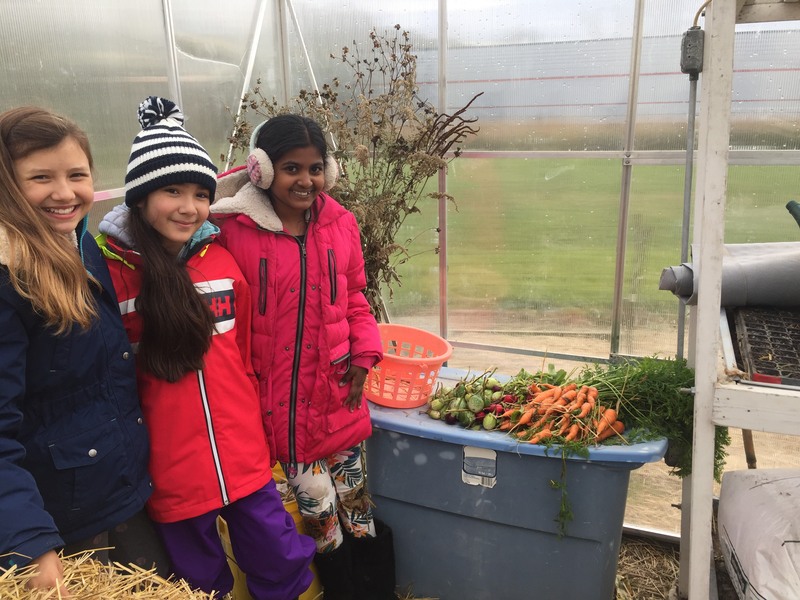 The 4th & 5th graders helped with the last of the harvest this week, picking eggplants, radishes & carrots. 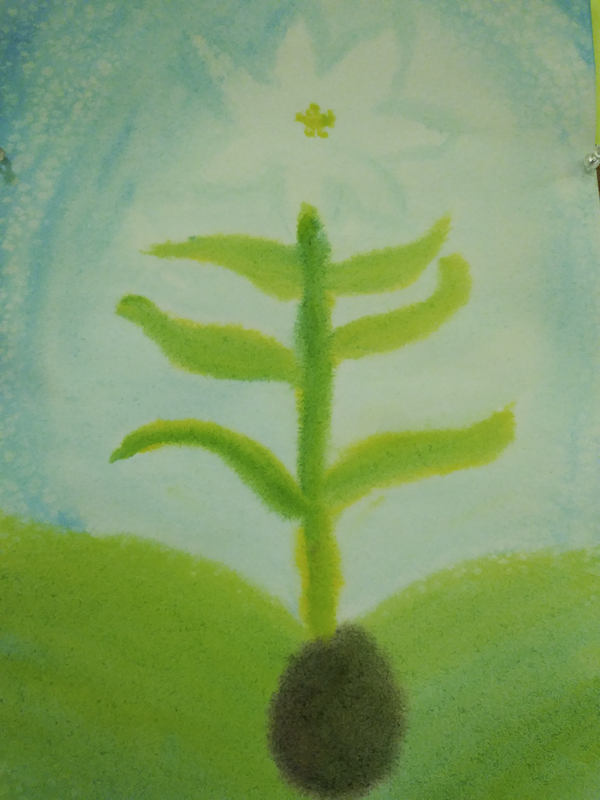 In case you’re wondering, our Asian eggplants are supposed to be green and they tend to grow smaller at the end of the season. 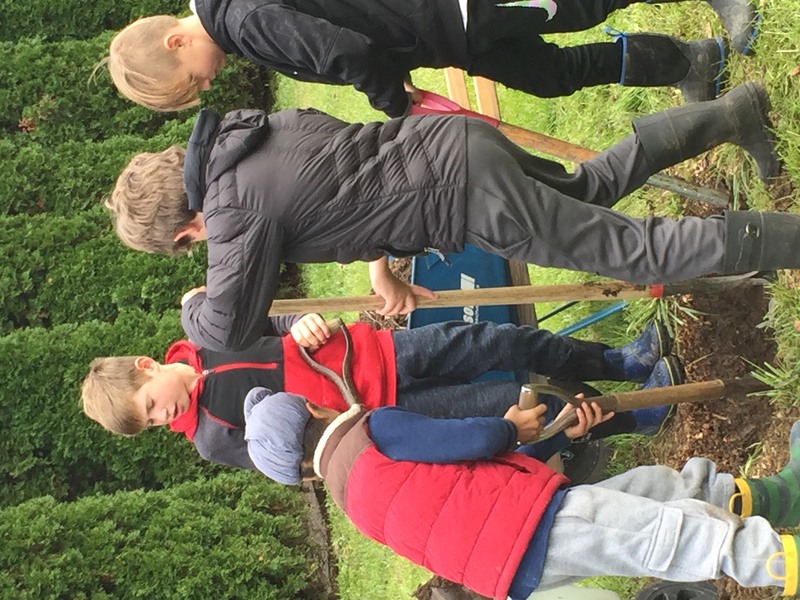 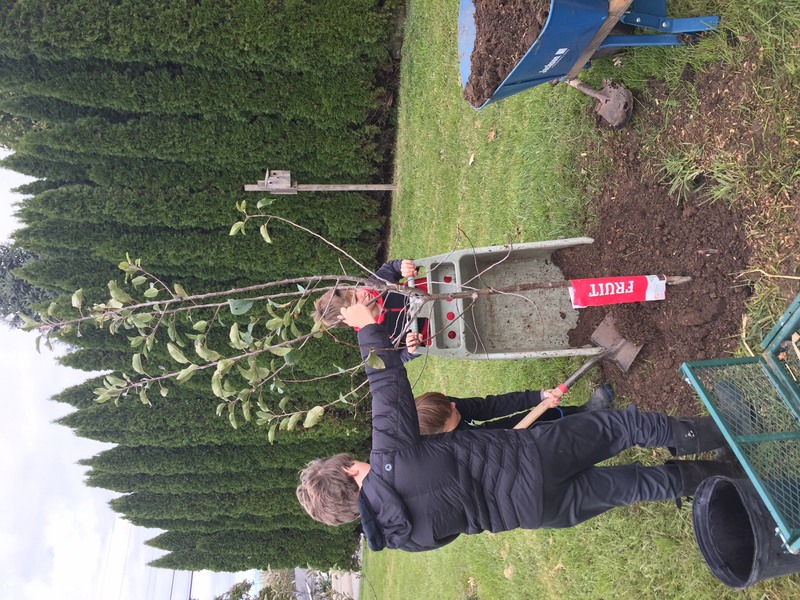 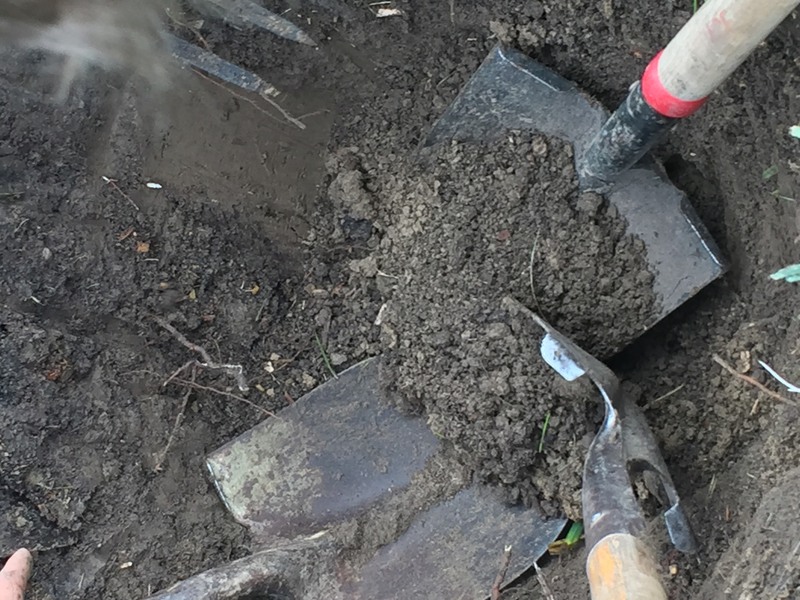 One of our apple trees was mysteriously destroyed, so our 4th & 5th graders replaced it during their Farm & Garden classes this week. 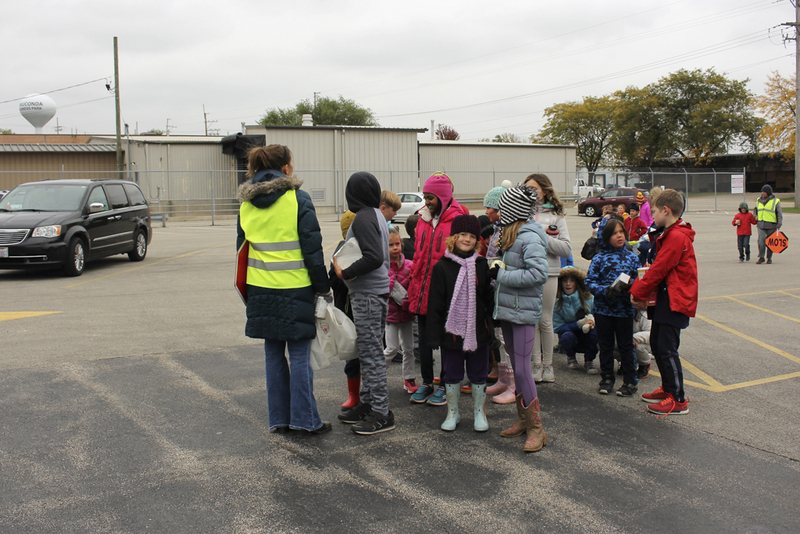 The 4th and 5th grades enjoyed a special visit from the mom and grandma of one of our fifth graders. 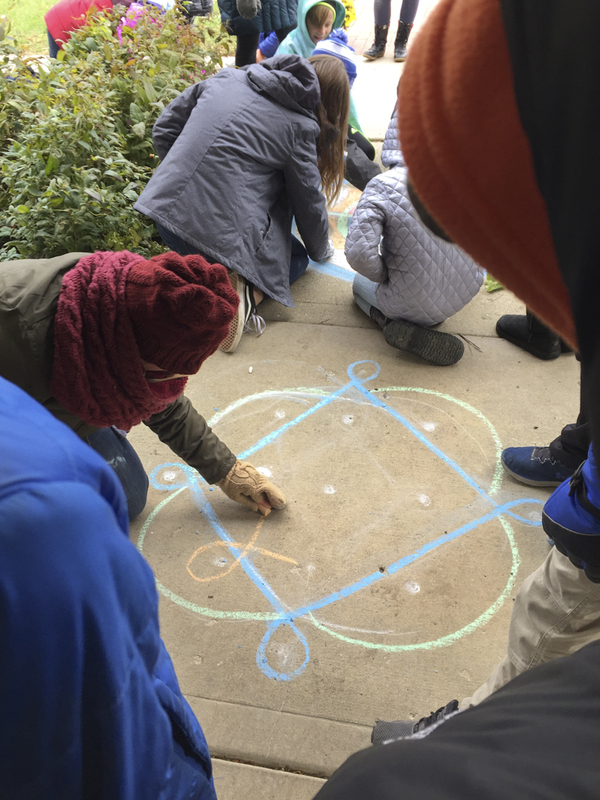 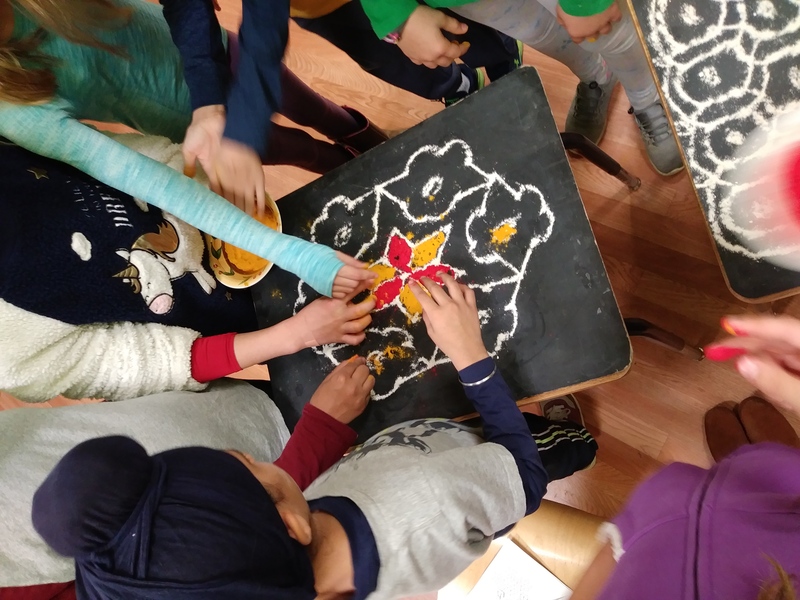 The fifth grade class is currently in their Ancient India block and have tried their hands at drawing rangoli(Hindi) or kolams(Tamil), or muggu(Telugu) with colored pencils. 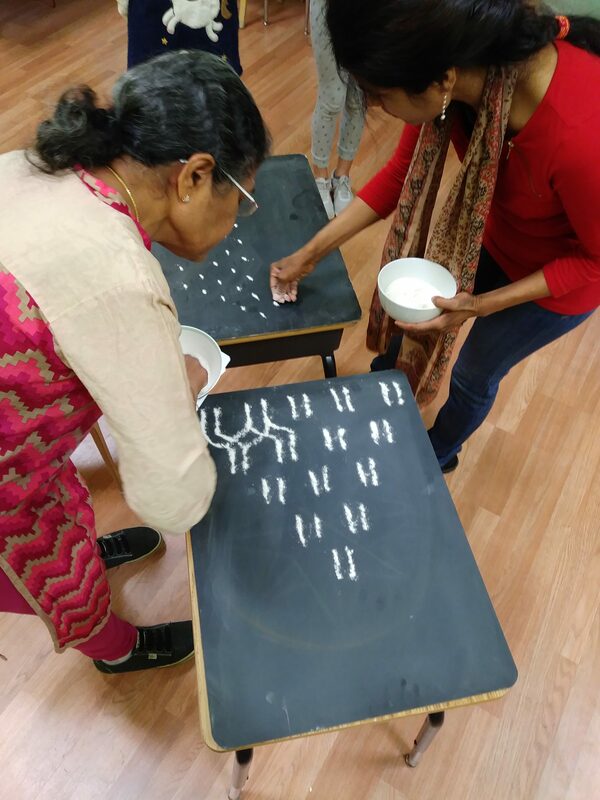 Ms. Kuchipuddi and Grandma arrived to show the students the traditional way of forming rangoli using rice powder, flour, and chalk, with turmeric and kumkum for natural coloring. 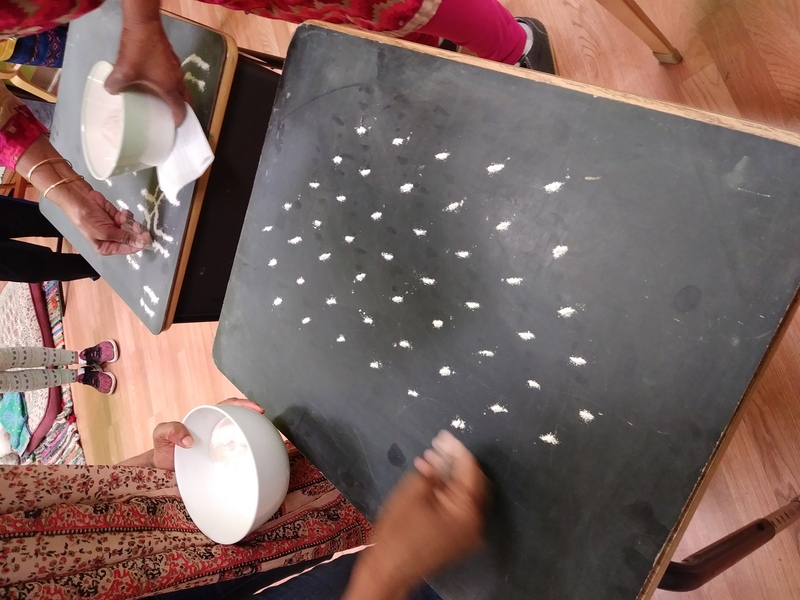 Grandma’s form focused on one method—connecting the dots or lines—to make a beautiful chariot to carry Brahma, Vishnu, and Shiva across the heavens. 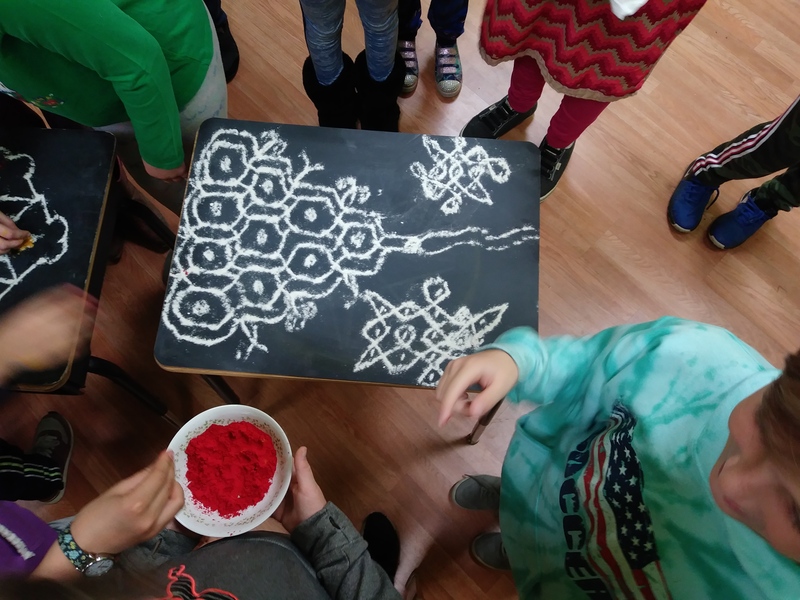 Ms. Kuchipuddi’s method required her steady hands to travel around the dots, with the end result forming a beautiful and fanciful geometric flower form. 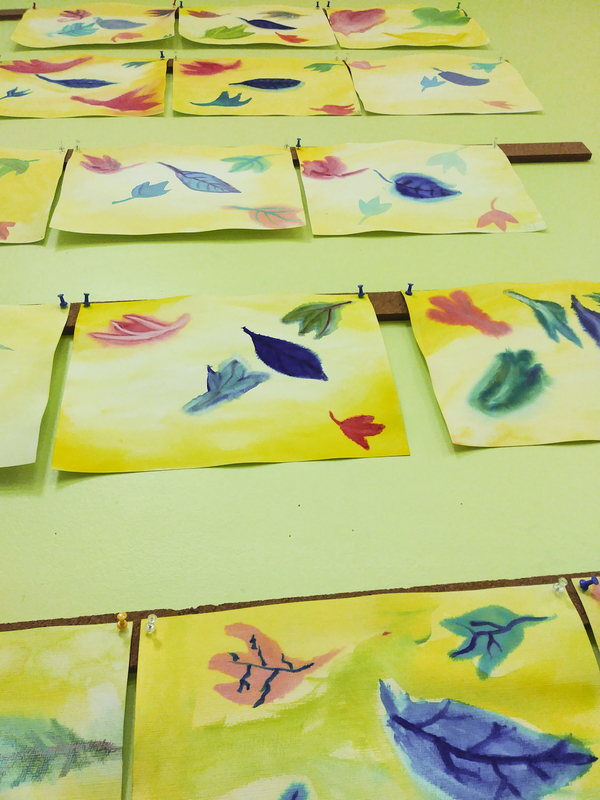 The students and I were amazed by the grace, speed, and beauty in which these free-hand works of art were created. 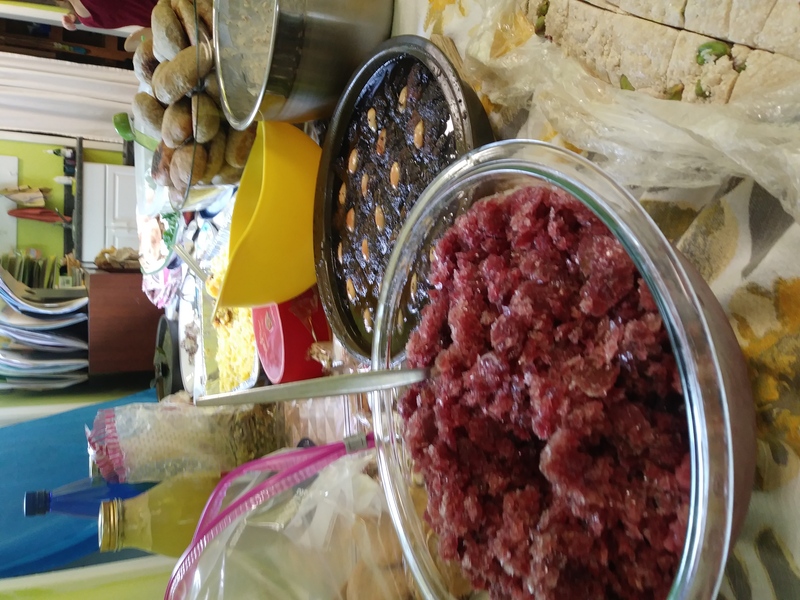 Many special thanks and a thousand blessings on Ms. Kuchipuddi and Grandma for sharing their time and talents with us! 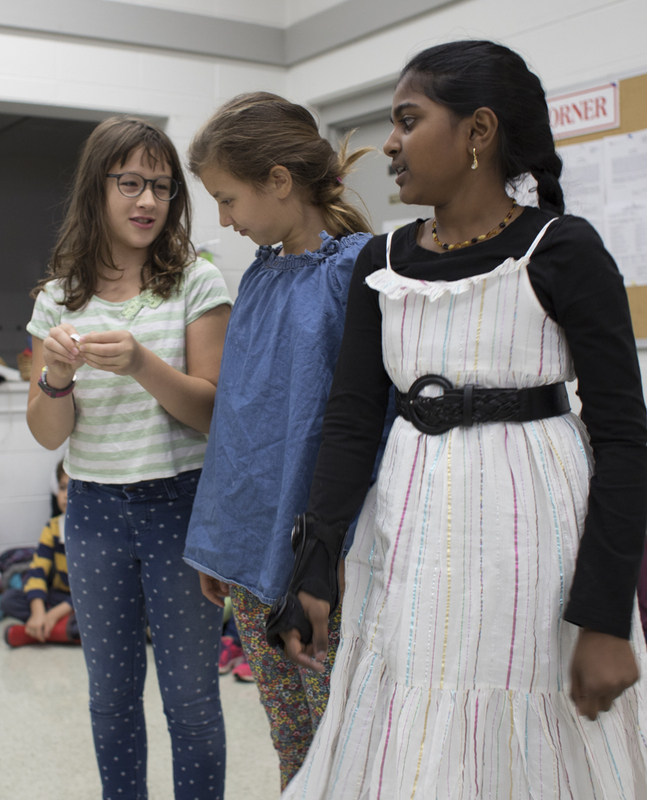 Fourth and fifth grade have gracefully leaped into the world of part singing! 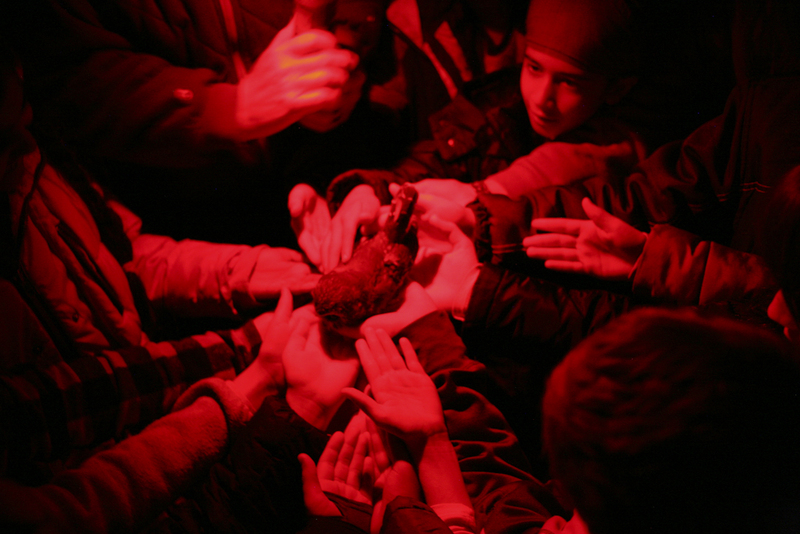 This is a step past singing in a round, where we all sing the same song but enter the song at different times. 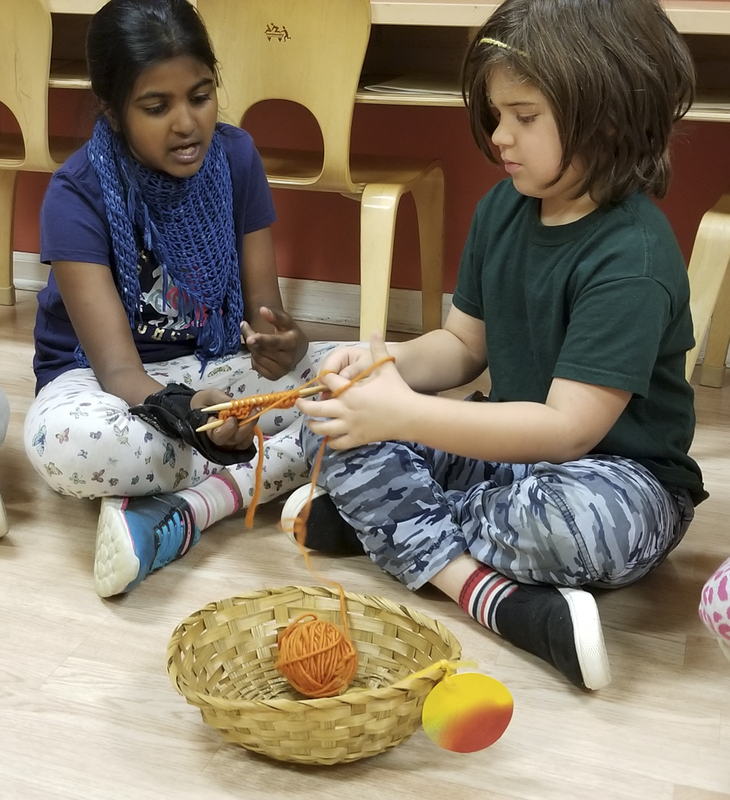 In part singing, each group is responsible for a different part of the song, but must also hear how their part works with the whole. 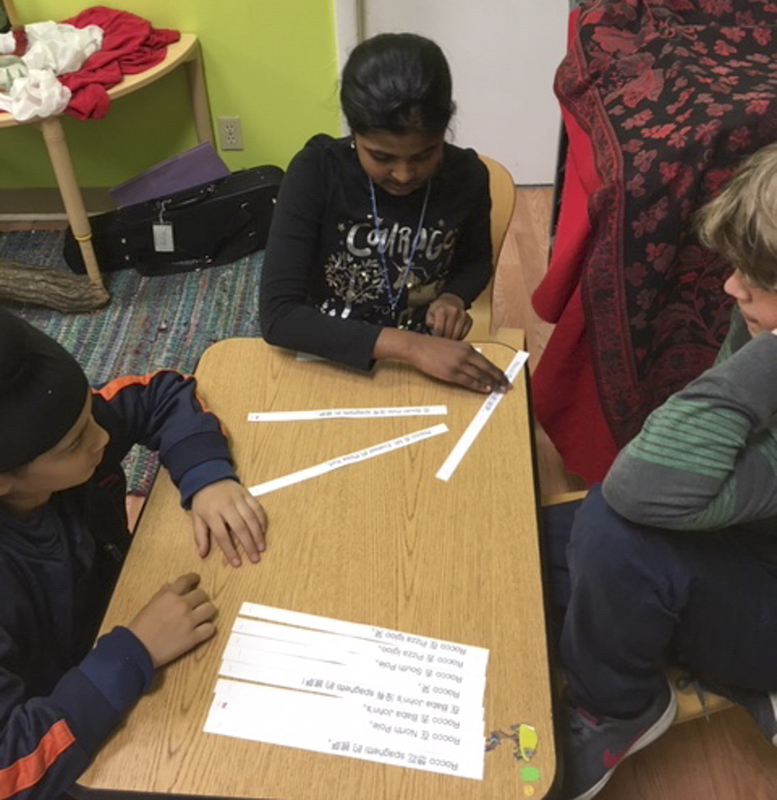 It is fun and engaging and requires concentration as well as a sense of rhythm and tone. 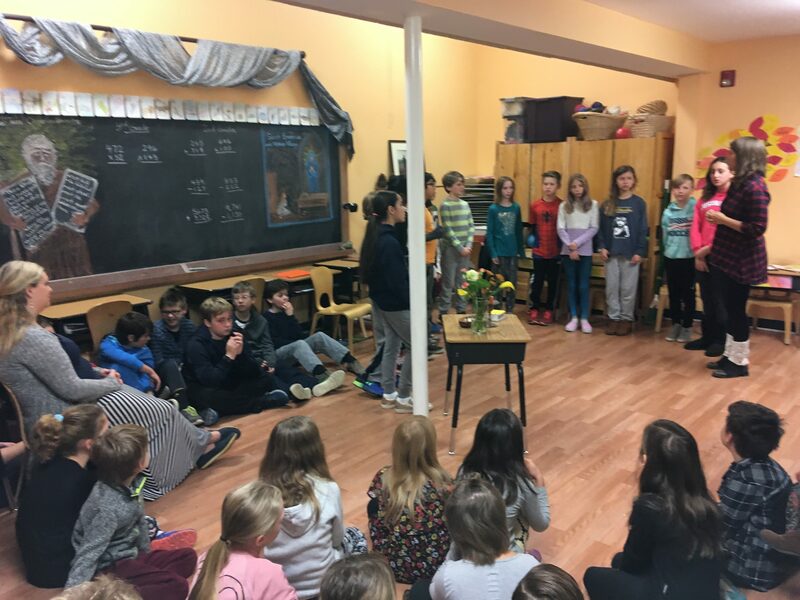 We saw examples of the class’s progress with part singing during this week’s community assembly. 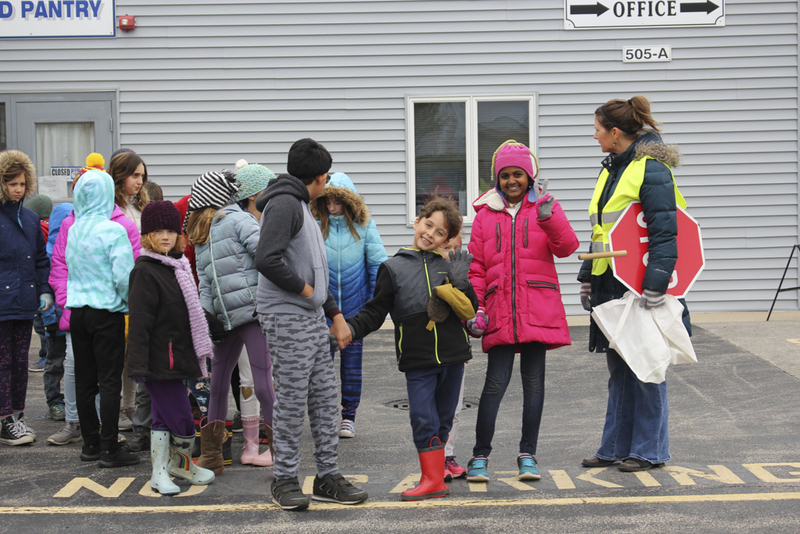 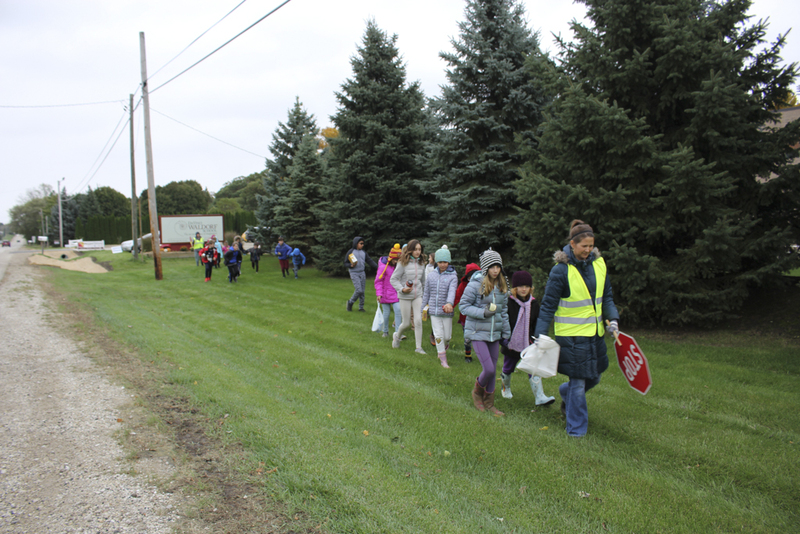 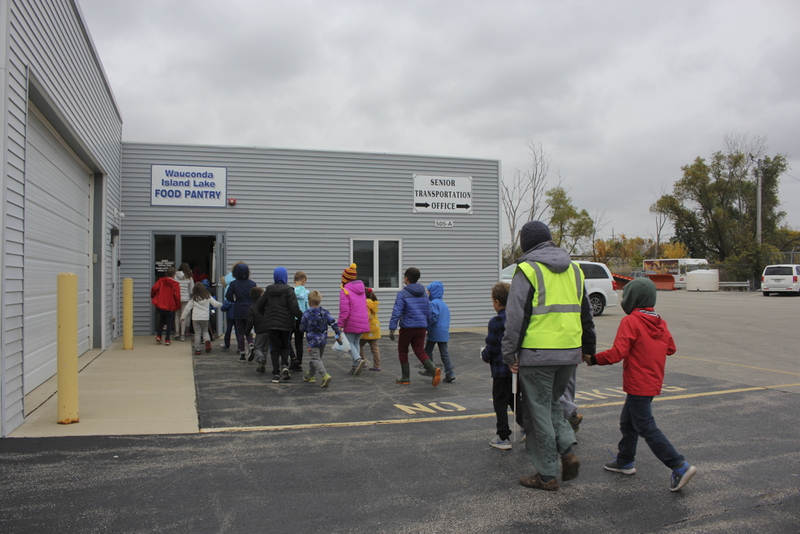 Our grade school students went on their second Pantry Walk of the year on Friday. 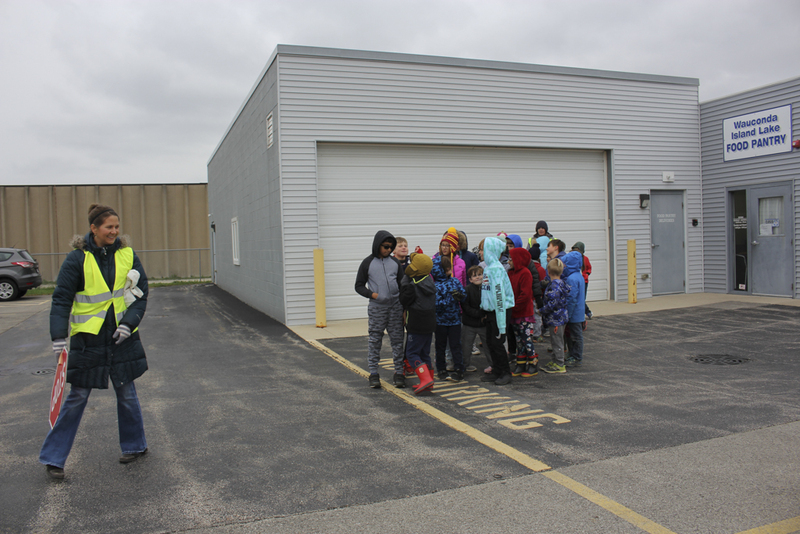 It was a smaller group than usual this week because 2nd, 3rd, and 6th grades were away enjoying a field trip. 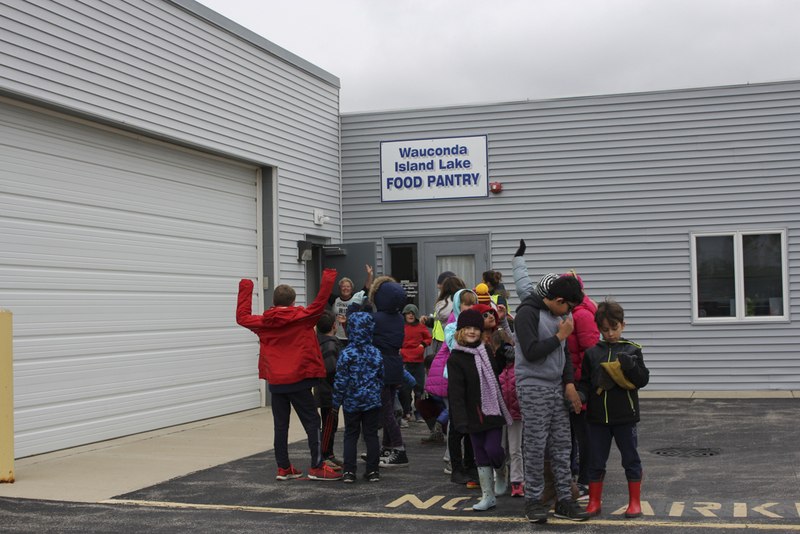 Each week until Thanksgiving break they will take our community donations to the Wauconda/Island Lake Food Pantry. 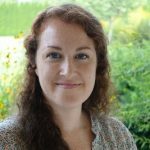 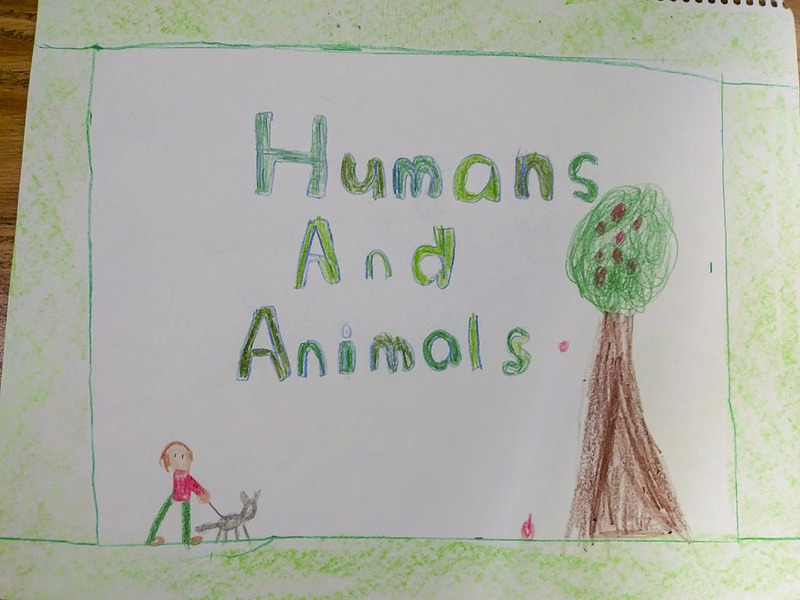 Thank you for your donations so far! 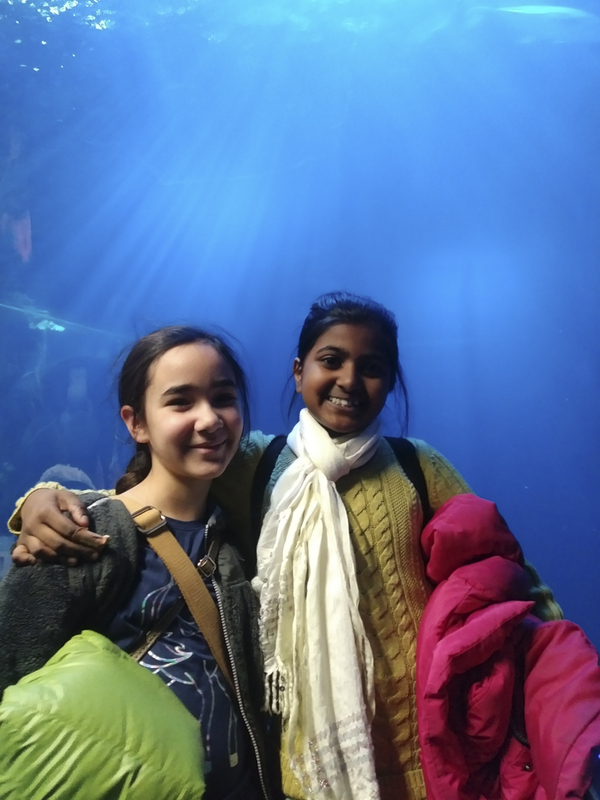 Please keep donating as you are able. 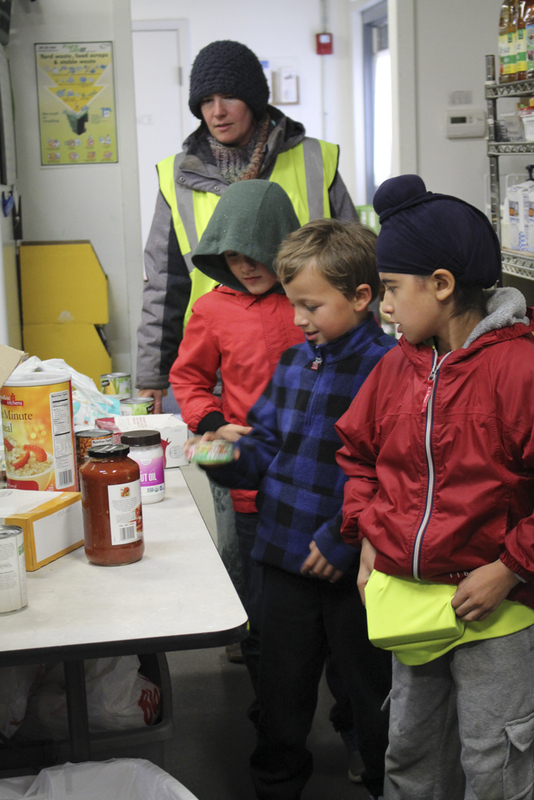 Our next Pantry Walk is this Friday, October 19th. 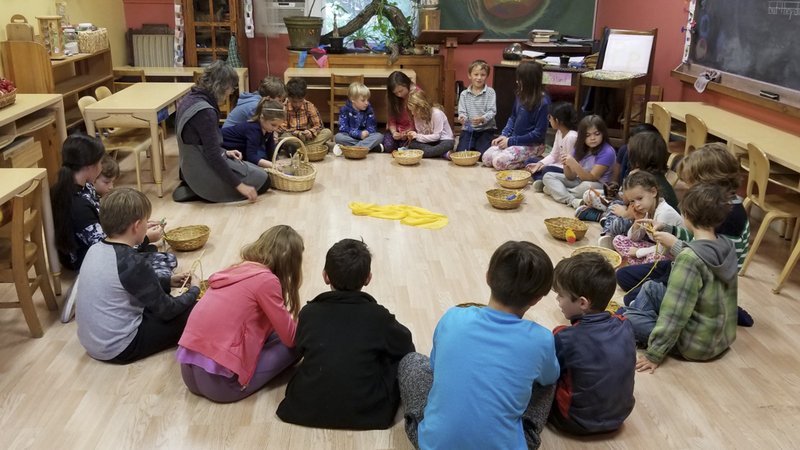 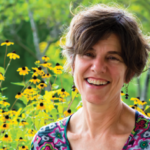 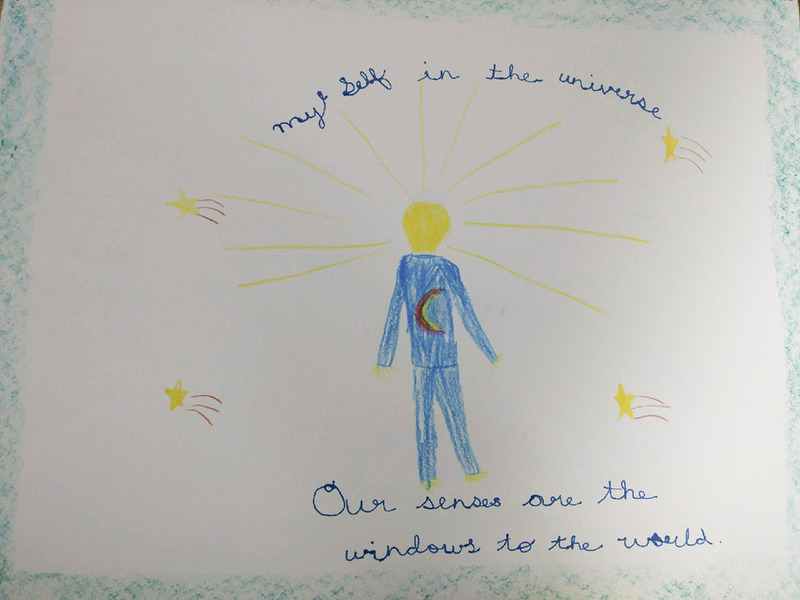 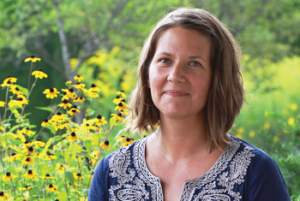 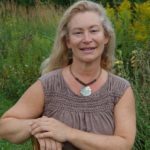 Waldorf education echoes the essence of Michaelmas. 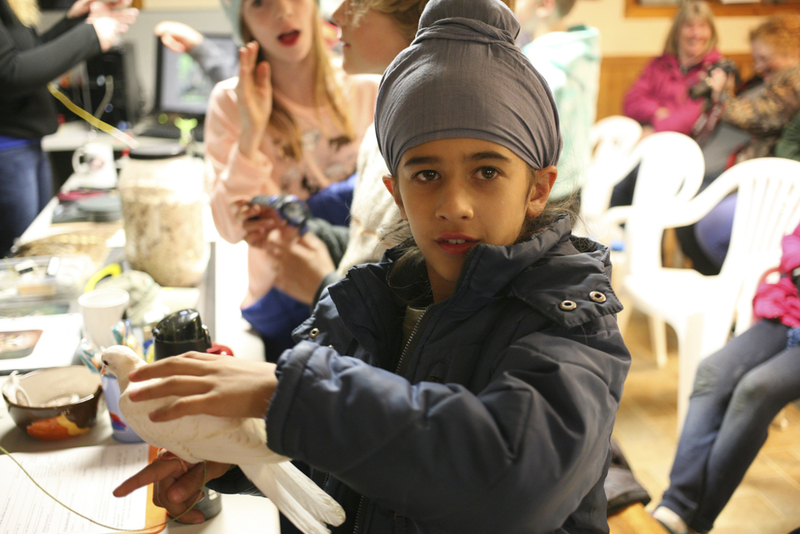 Each and every one of us has gifts to bring to the world. 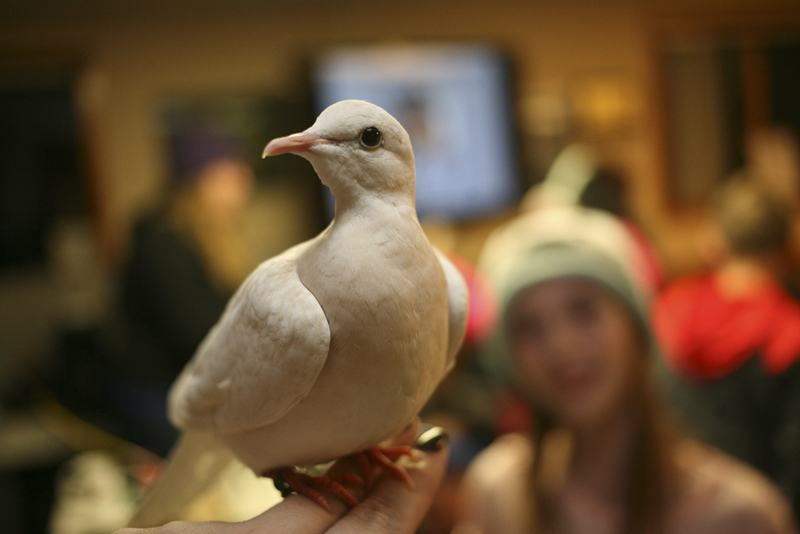 Michaelmas is a reminder of the process of becoming as we strive toward our full potential. 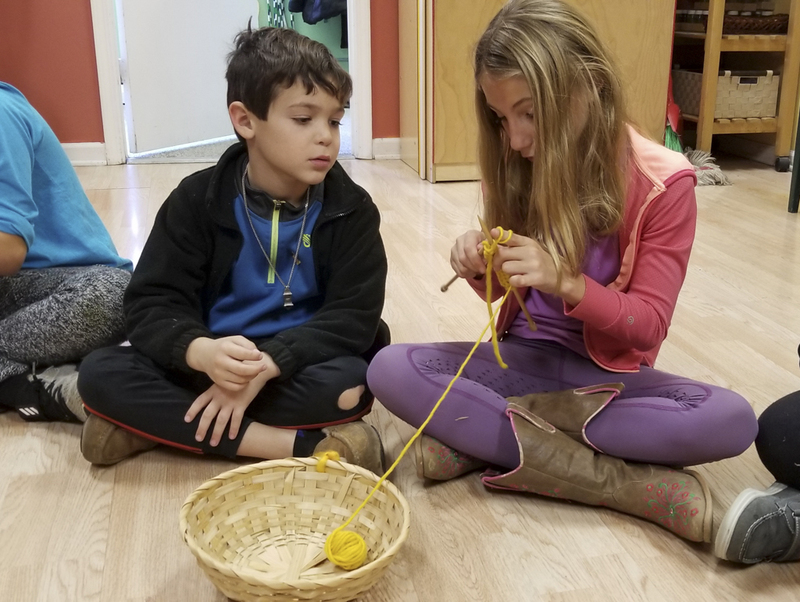 For children, Michaelmas and themes of courage are manifested in activities of the will, so in the spirit of Michaelmas during this season, we give them opportunities for deeds that engage their wills and help them to think outside of themselves to others. 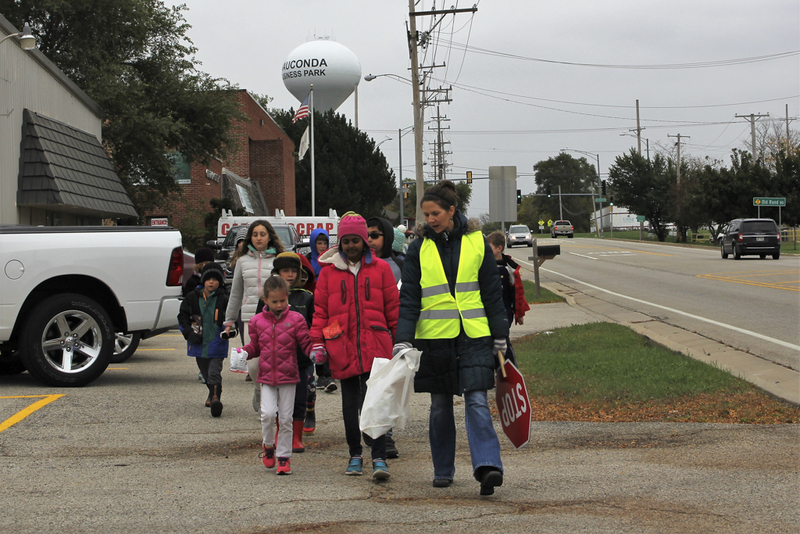 Our Walk was accompanied this week by Beth Bejnarowicz, mom of a DVWS alumnus. 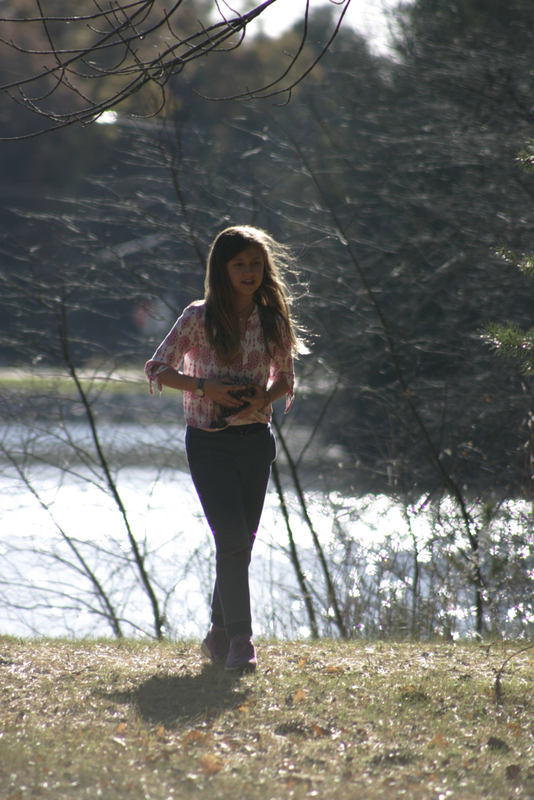 Many thanks to her for the great photos of the day! 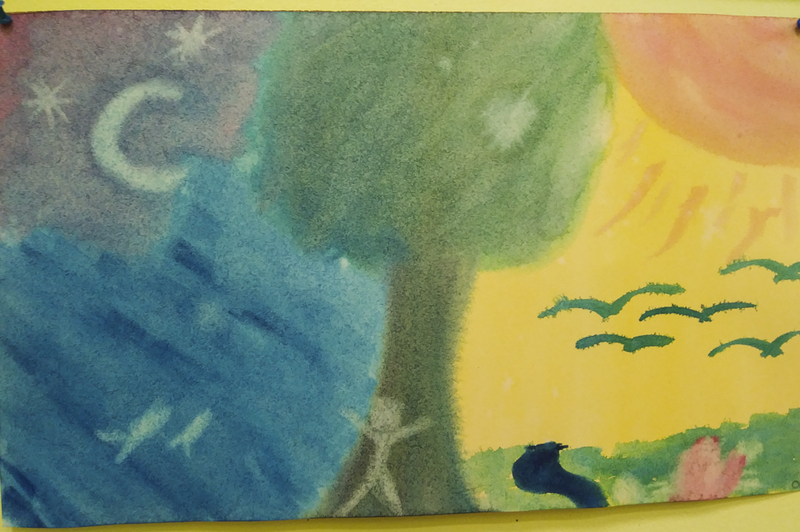 Fourth grade wrapped up their Human and Animal block with a watercolor painting of the four kingdoms of nature. 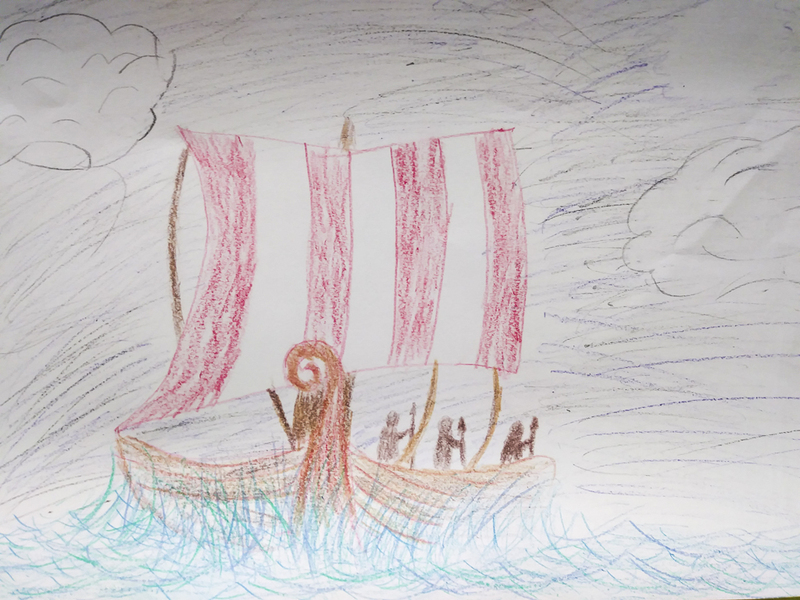 Now they have set sail into the adventures of the Norse gods and goddesses! 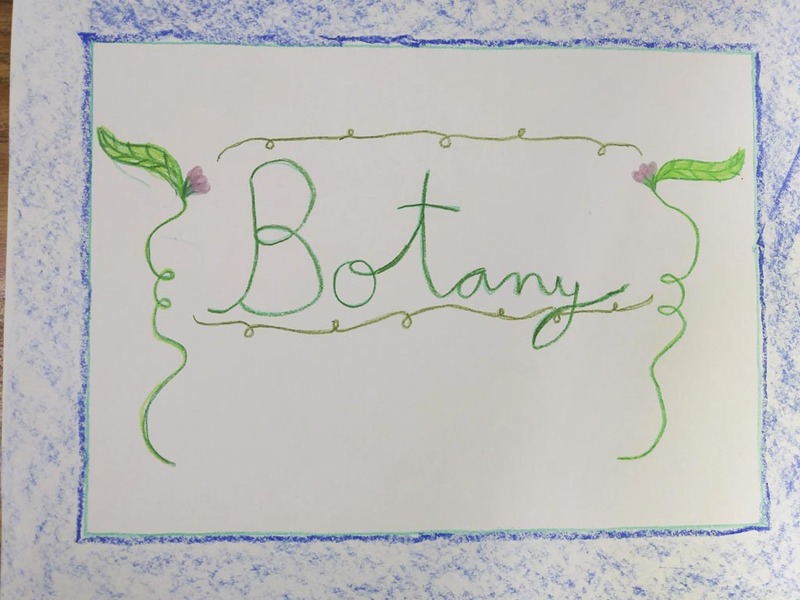 Fifth grade closed their Botany block with a watercolor painting of a lovely monocot—a lily. 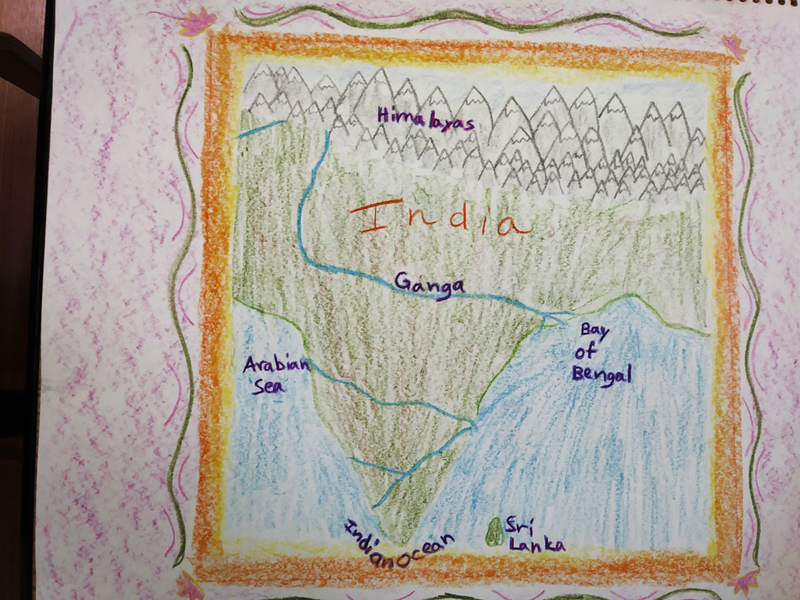 Now they are traveling to the other side of the world as they study the ancient history of India. 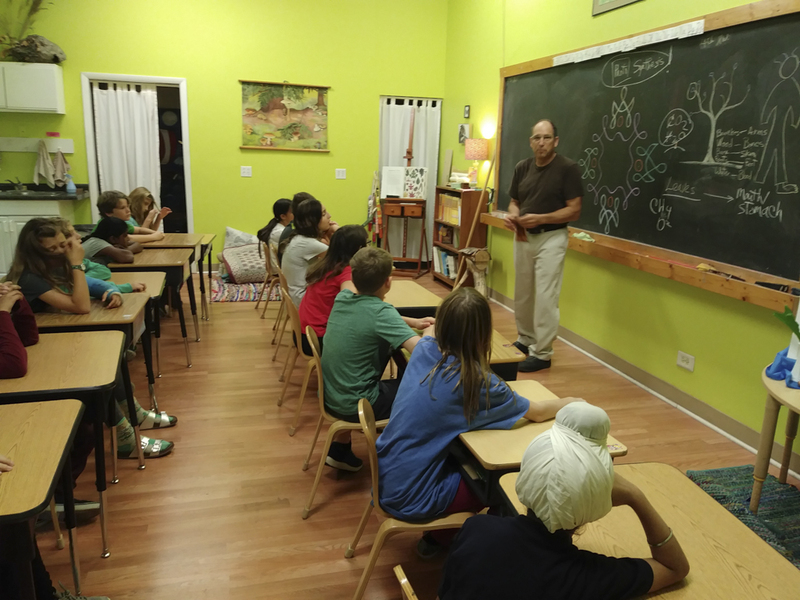 The fourth and fifth grades both enjoyed a special visit from longtime Waldorf teacher, artist, and musician Chet Celenza. 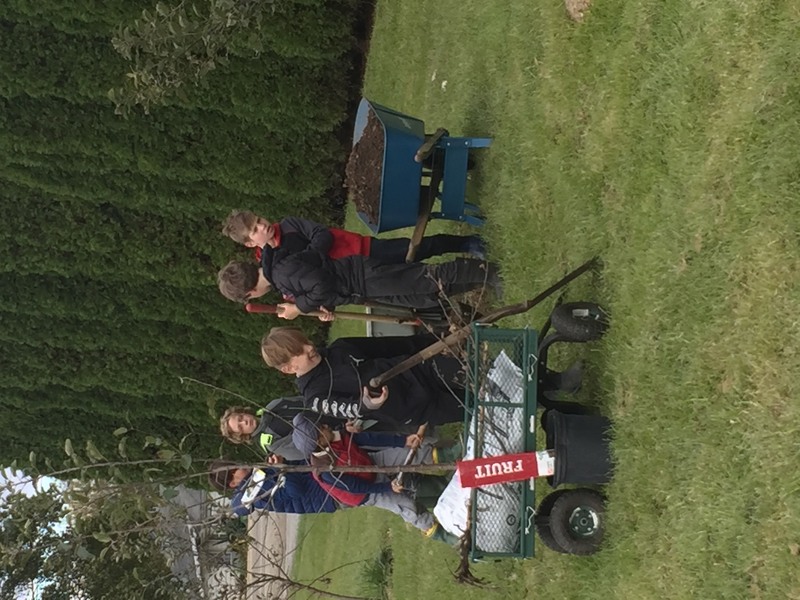 Mr. Celenza, who for many years has been a Pentathlon favorite as the long-jump event leader, walked the students through the intricate and beautiful study of trees in our schoolyard and beyond. 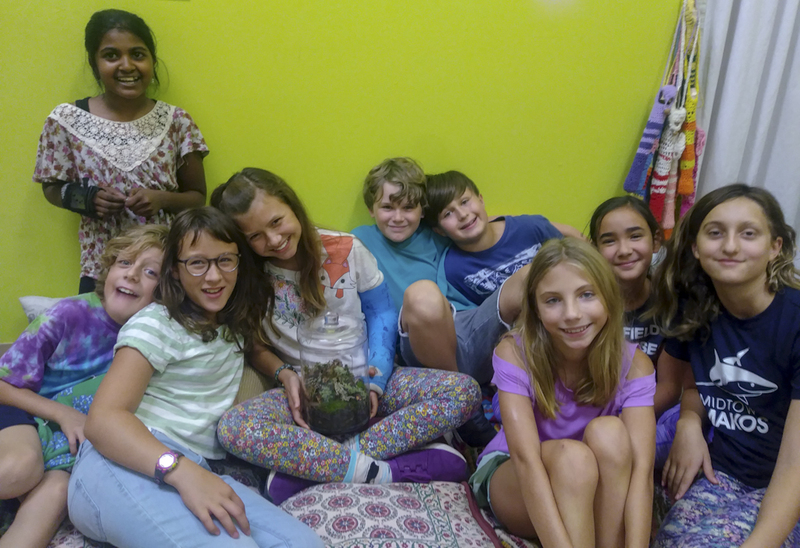 This combined class also joined forces to make a terrarium home for our class pet…a milipede! 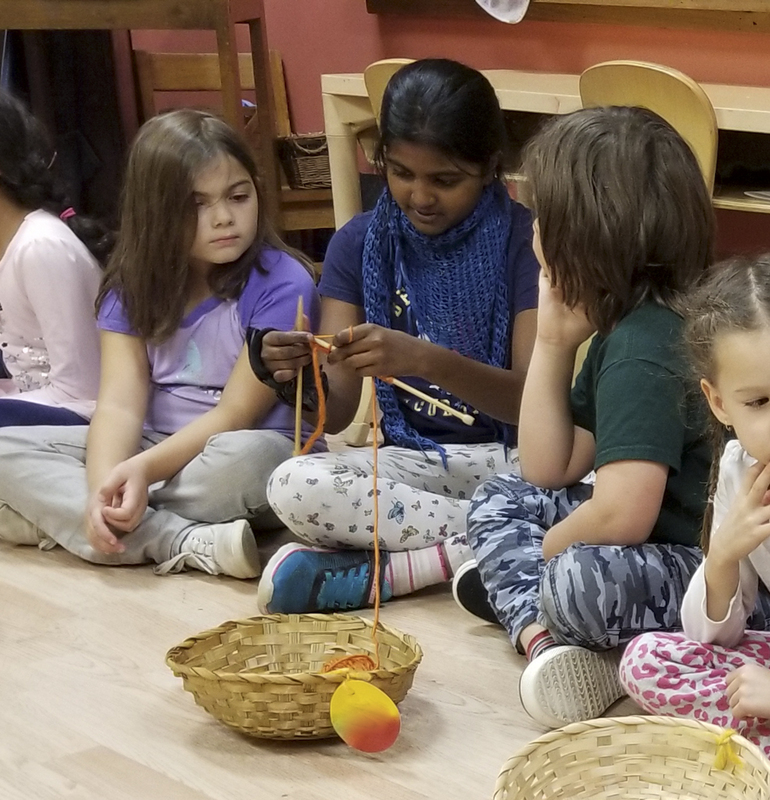 Fourth and Fifth grades enjoy their music class together with music and orchestra teacher Mrs. English. 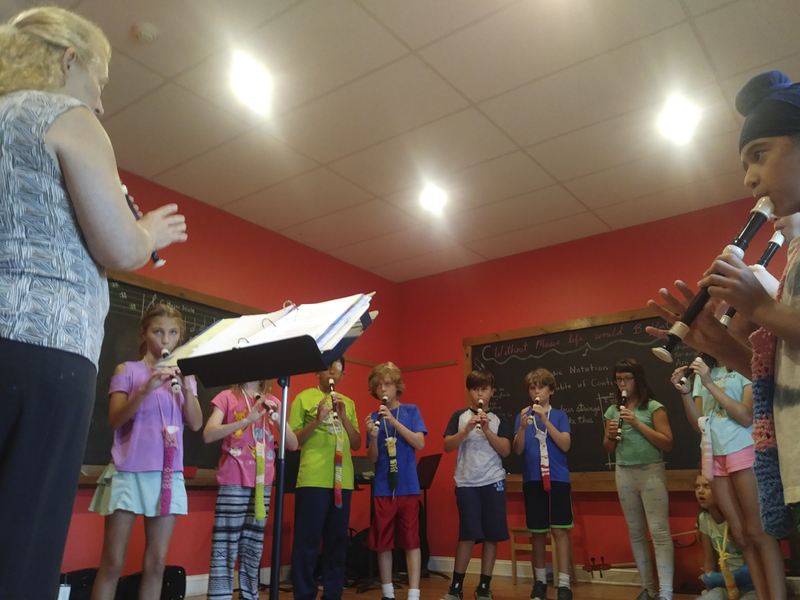 Here, they practice recorder, a wonderful way to develop their listening abilities and to provide another window into the world of playing music with a group. 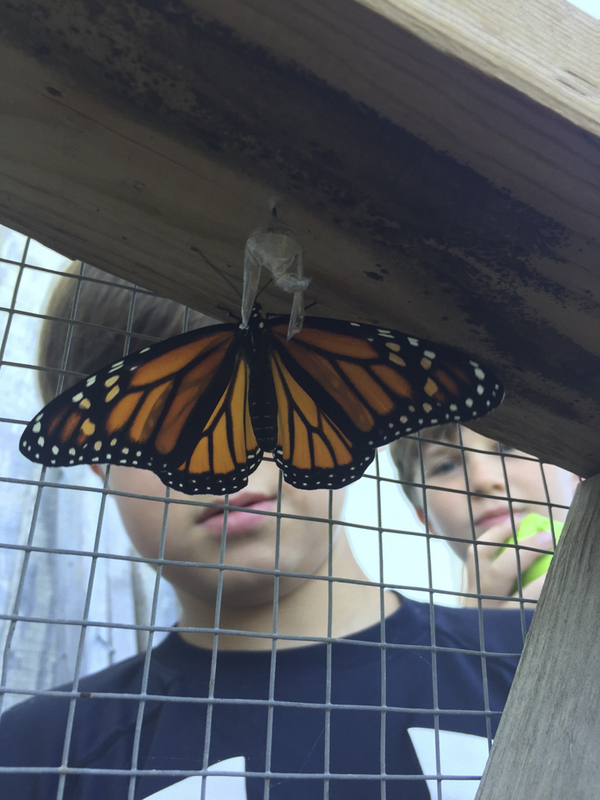 During farming class this week we were able to observe a Monarch butterfly which had just emerged from her chrysalis home (inside the chicken coop)! 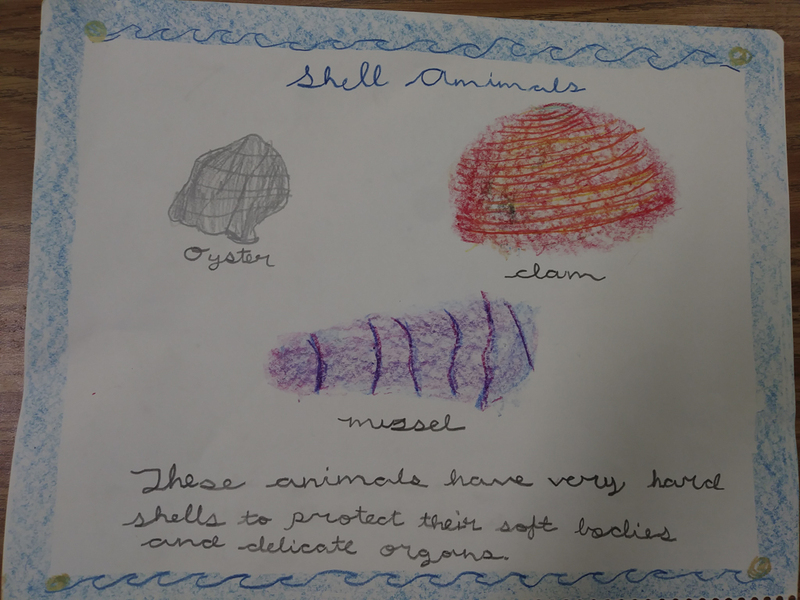 Fourth grade focused on shell animals this week, using modeling, drawing, and writing to express what they learned. 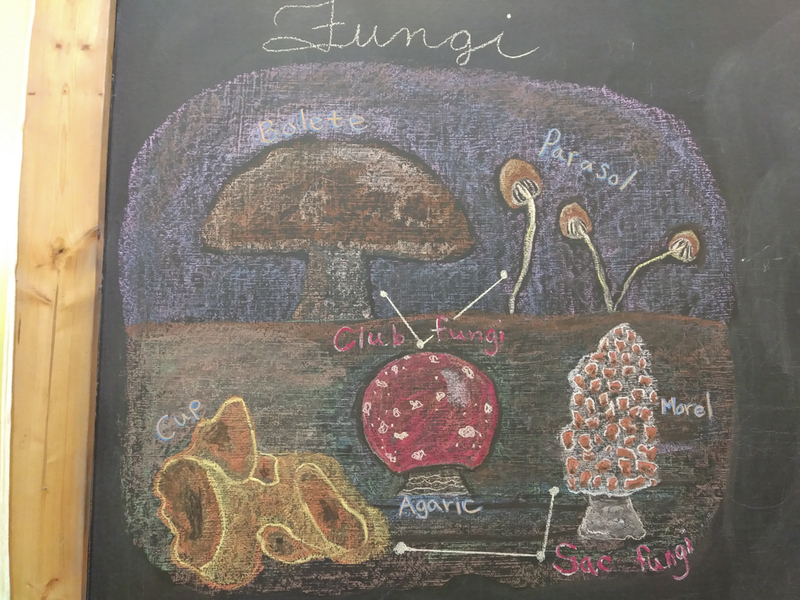 Fifth grade entered the mysterious fungi kingdom to compare and contrast different species and types of mushrooms. 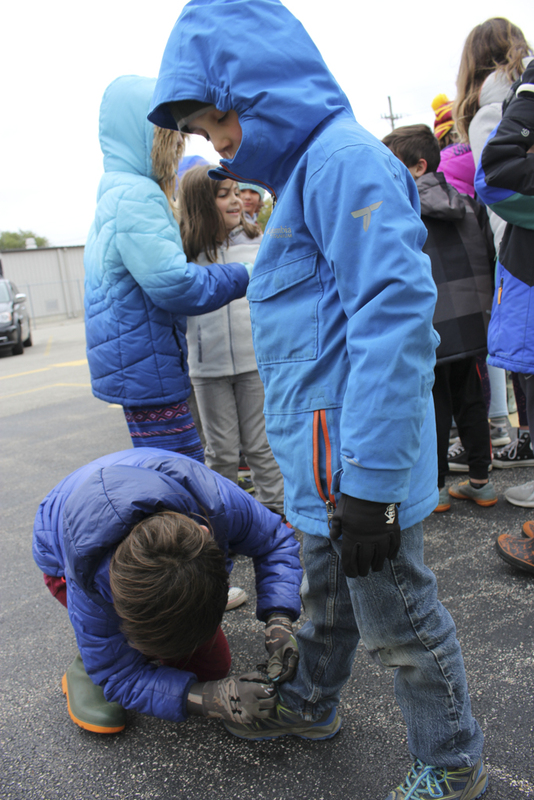 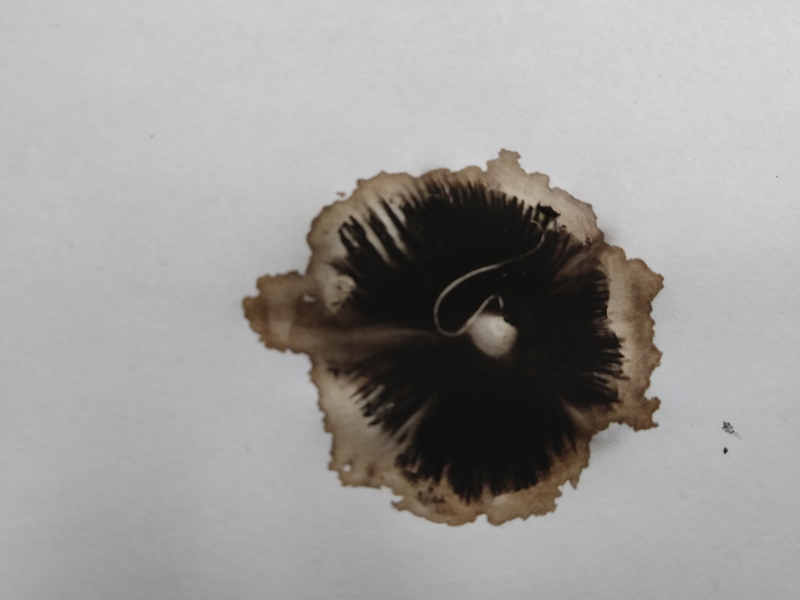 Several fifth grade students went mushroom hunting on the playground and found a few for us to experiment making spore prints from the mushroom caps! 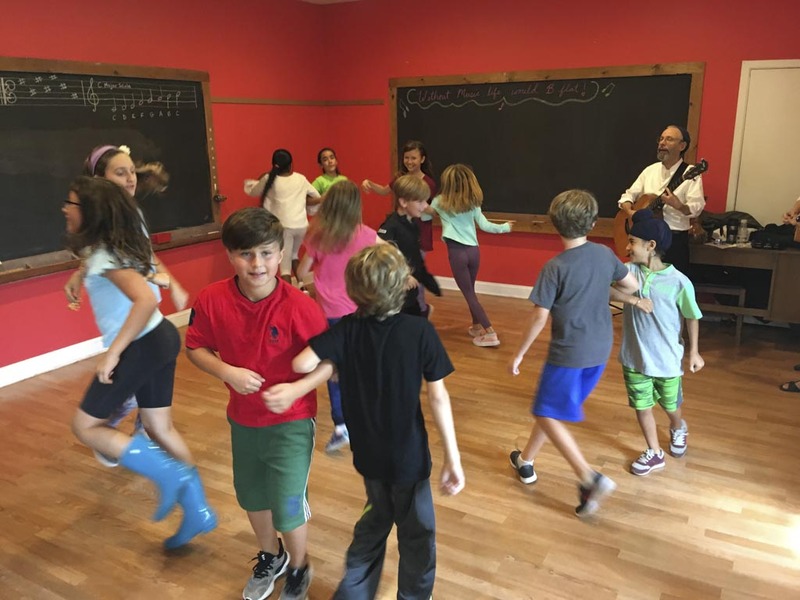 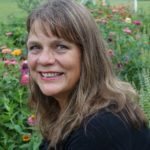 Grades classes have folk dancing on Fridays with the teaching duo Jutta Distler and Terran Doehrer (Jutta & the Hi-Dukes). 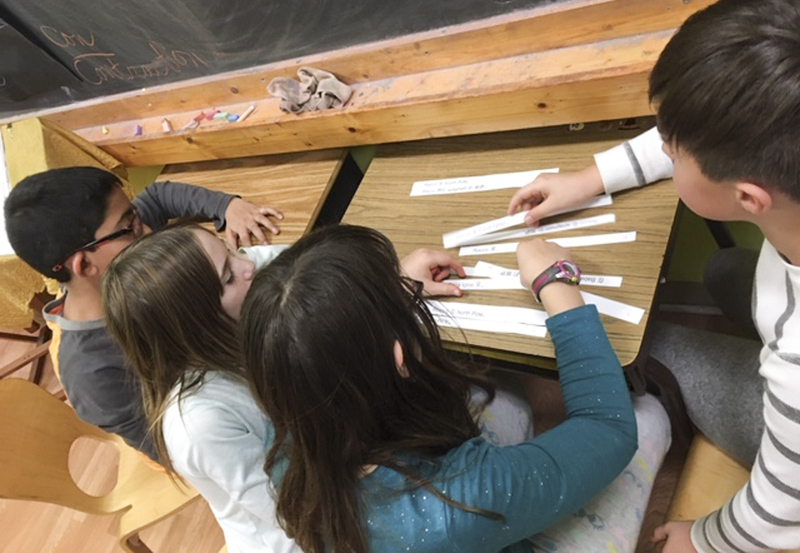 This photo catches the 4th and 5th grades in action during their first lesson. 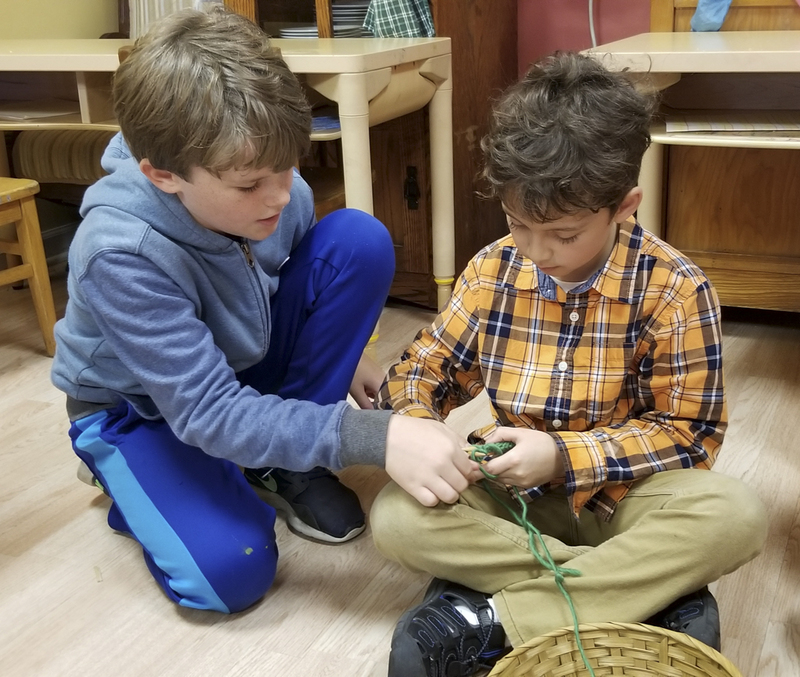 Fourth grade began their year with the Human and Animal block, while fifth grade headed into the intricate world of Botany.